VCE was assigned with the performance of the required measurements, the evaluation and the preparation of the civil engineering verification as well as the programming of a calculation tool. 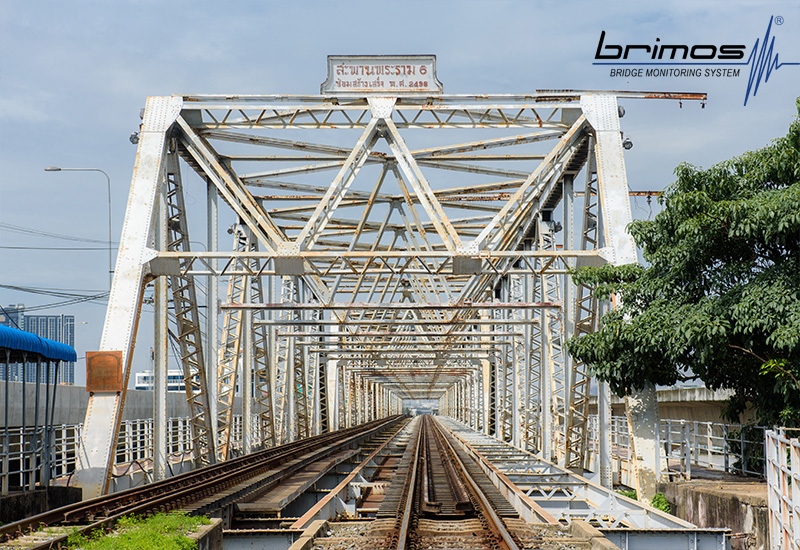 In the course of the seminar the bridge inspection of RAMA VI Bridge (Railway Bridge in Bangkok) using BRIMOS® technology and the results will be presented. 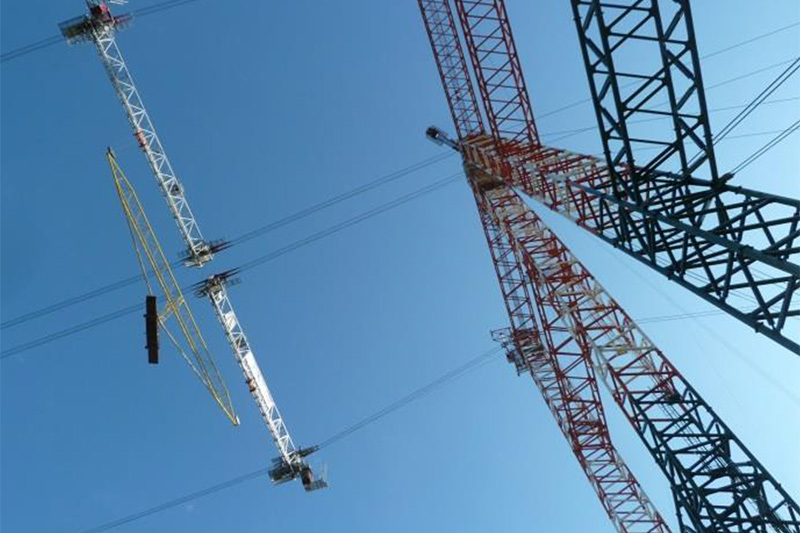 VCE first carried out a TDD (Technical Due Diligence) in the course of trans­action for the construction sites 5, 8 and 6 and subsequently the building project was supported in the scope of a construction monitoring order. After the conclusion of monitoring, VCE has still been involved in technical consulting. At VCE challenges of various levels of engineering tasks are on the daily agenda. But deep down VCE is also a home for creative minds. 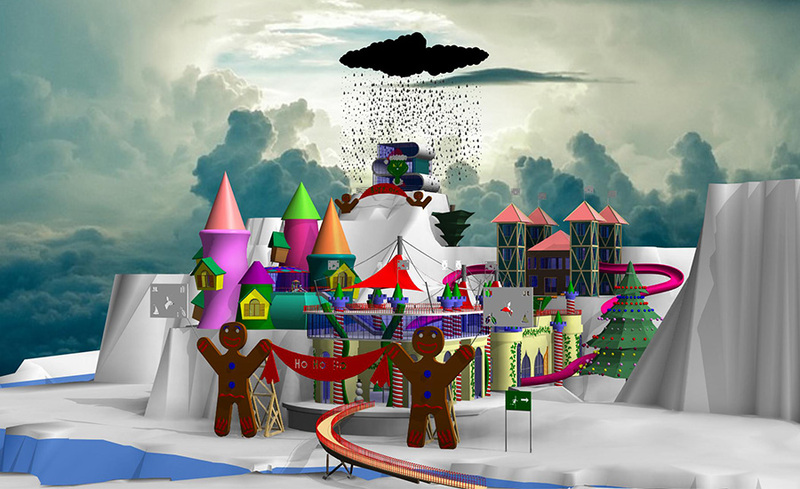 In the course of a “Santa’s Workshop” BIM competition they let their imagination run wild. European Concrete Award 2018 for the ÖAMTC Mobility Centre! 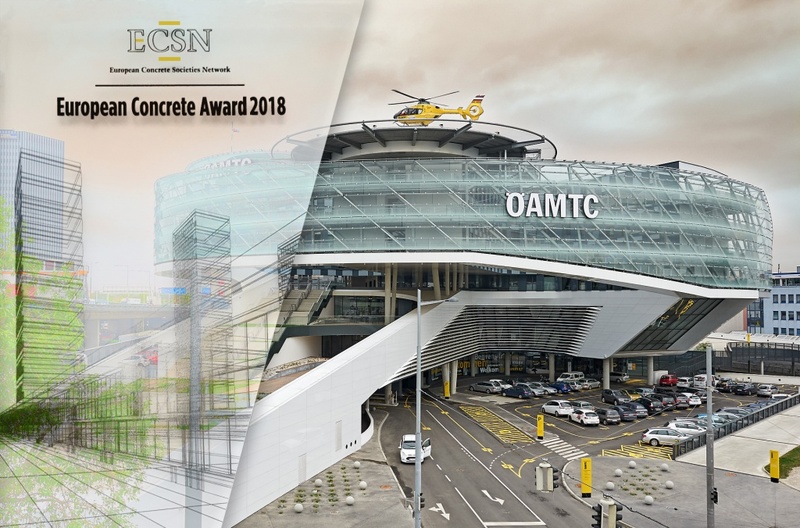 In the category “Building” the EUROPEAN CONCRETE AWARD 2018 went to the project “ÖAMTC Mobility Centre”, Vienna, Austria. The load-bearing structure of the building has a number of specific features rarely encountered in such a density or combined in such a way. 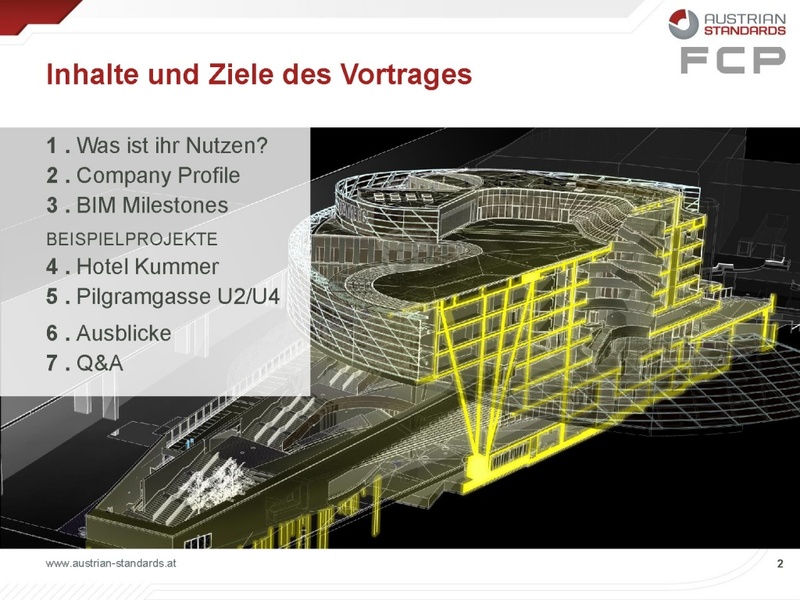 In addition to these facts the whole project team worked with BIM. 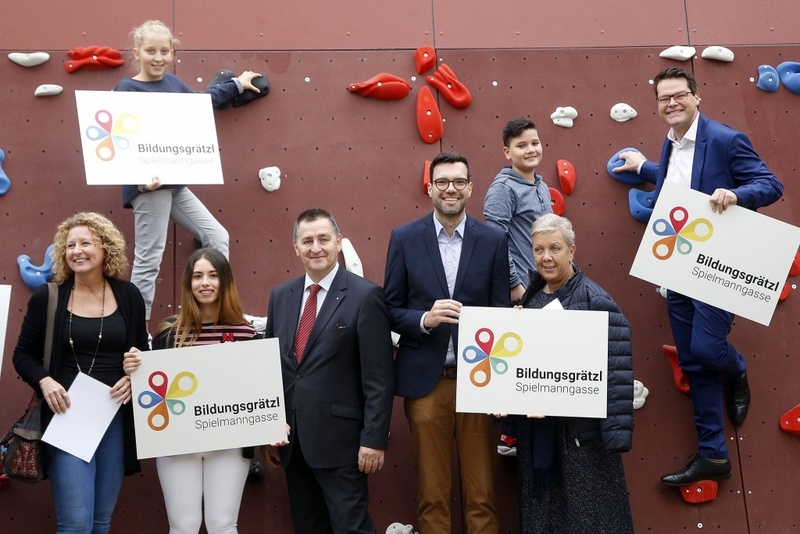 On Tuesday, 2 October 2018 the new school centre “Spielmanngasse” was officially opened in Vienna’s 20th district (Brigittenau) in the area Dietmayrgasse-Spielmanngasse. Two existing elementary schools were extended and additionally a new secondary modern school was constructed. In total 20 new classes for elementary school and secondary modern school were established. 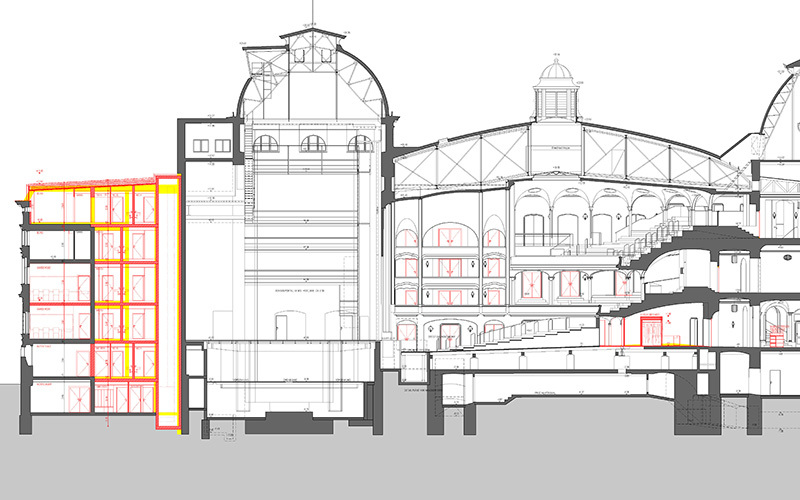 Thus, the existing sites were extended by 9,100 m² of gross floor area. 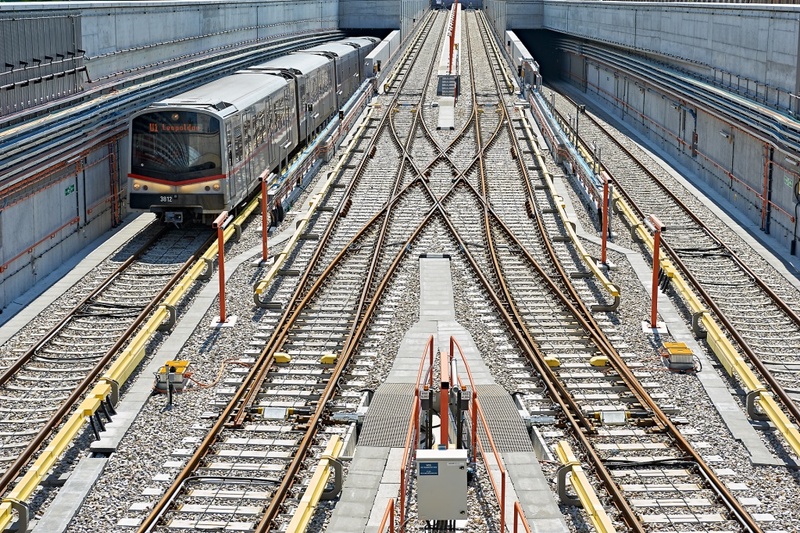 Which load pattern do you use for track design? 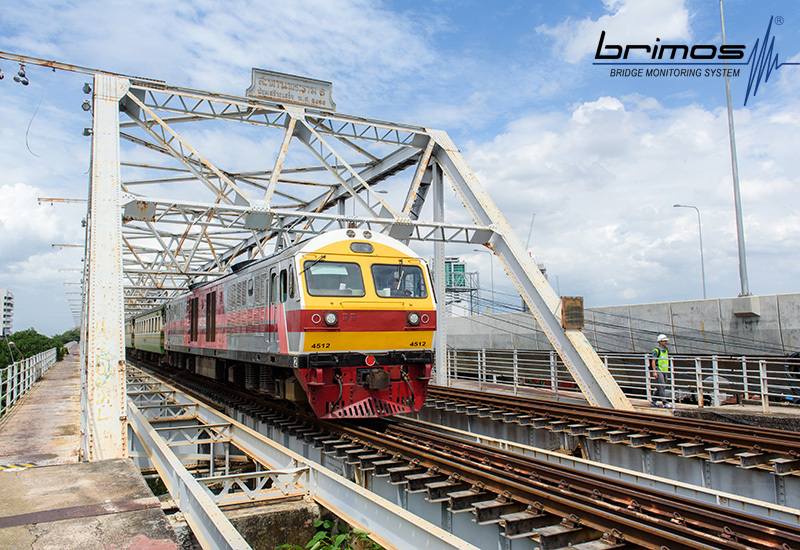 In rail track engineering it is common to apply load models developed for design and assessment of bridges as an approximation of loading regimes for rail tracks. 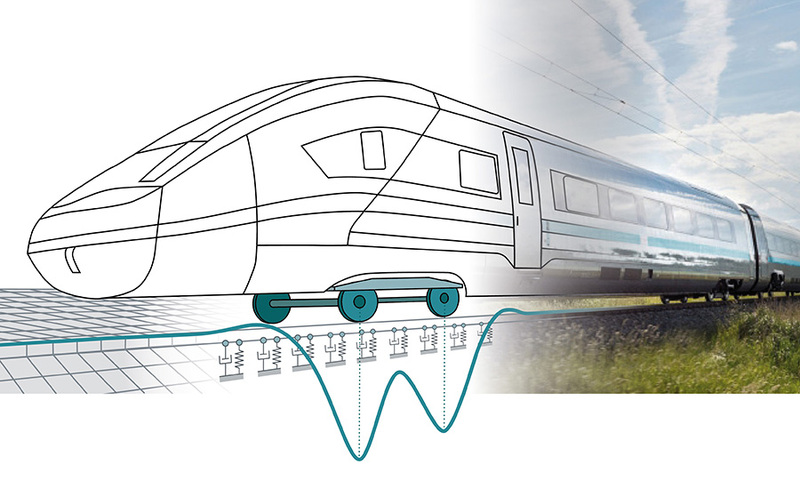 VCE’s client questions the traditional approach and is interested in developing realistic load models for track designers. VCE proposes a novel load model consisting of both a realistic load pattern and spectra of dynamic amplification factors. This study contributes to the existing body of modifications to the next generation of modern track design codes. 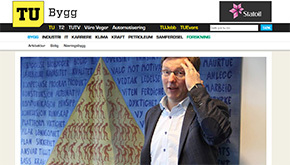 Theory, findings and possible applications will be published on the client’s website in the first quarter of 2019. 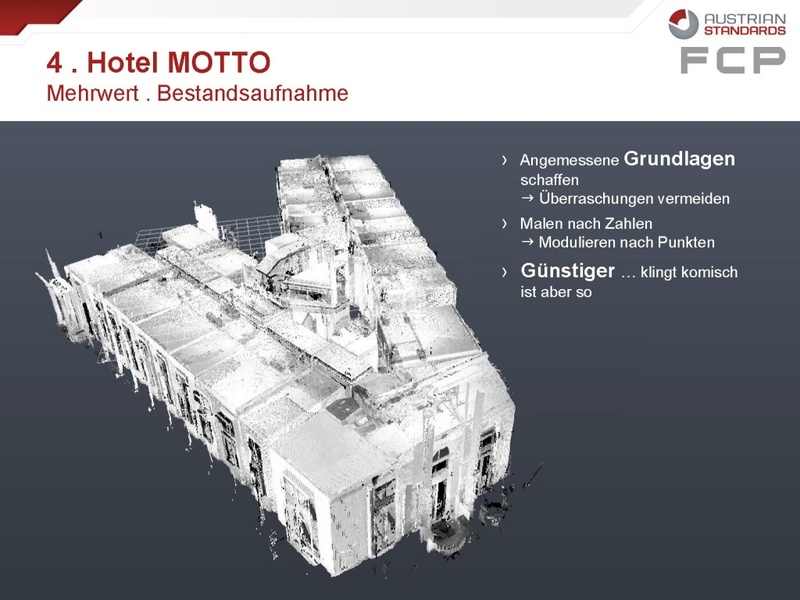 Wolf-Dietrich Denk and Frank Mettendorff presented their experience with BIM by means of two project examples – Hotel Motto and Pilgramgasse U2/U4 – at the practice day Building Information Modeling by Austrian Standards on 26 September 2018. 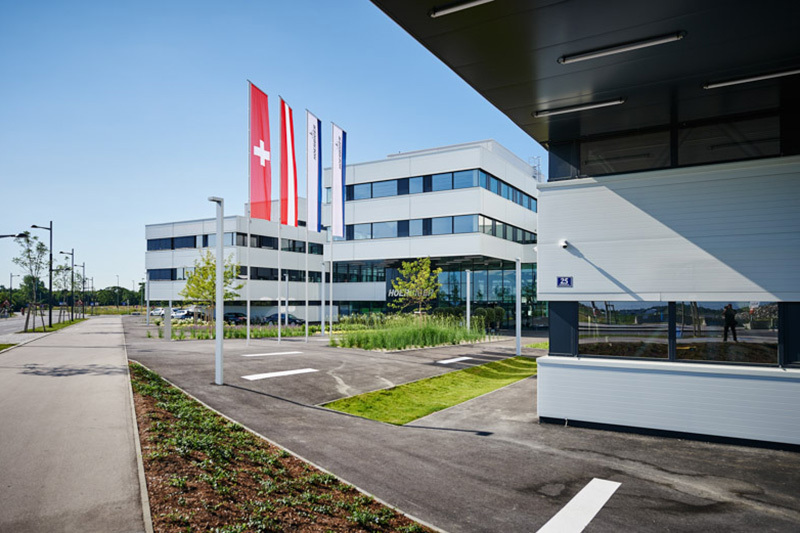 The next presentation takes place in the Building Academy in Steyregg, Upper Austria, on 11 October 2018. 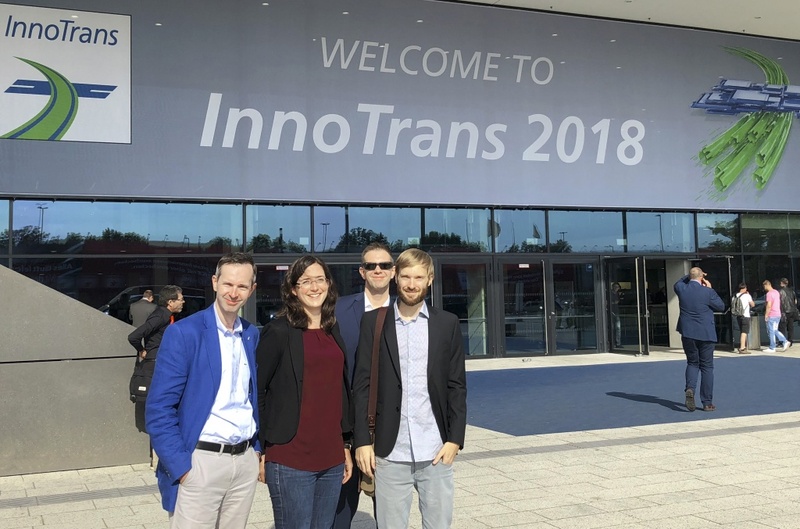 VCE was at the InnoTrans 2018 fair in Berlin – a look into the future of mobility was taken, new contacts were established and old contacts were fostered. 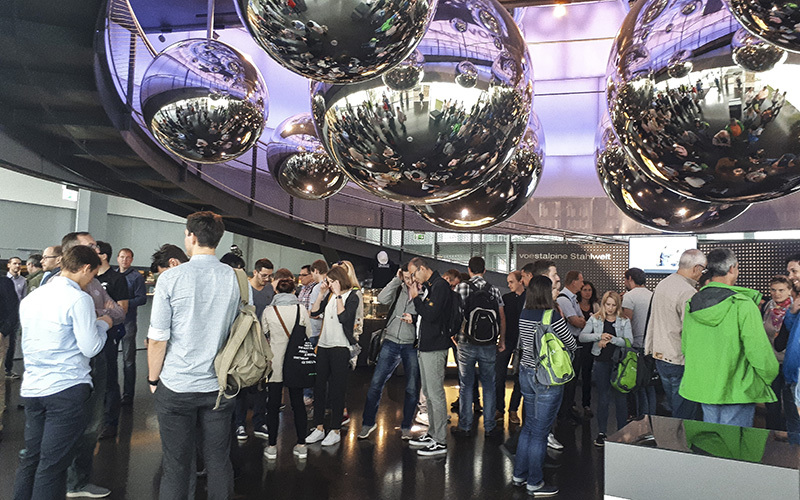 The company outing of FCP.VCE with a visit to the steel world and the museum of contemporary history of voestalpine in Linz took place on 14 September 2018. 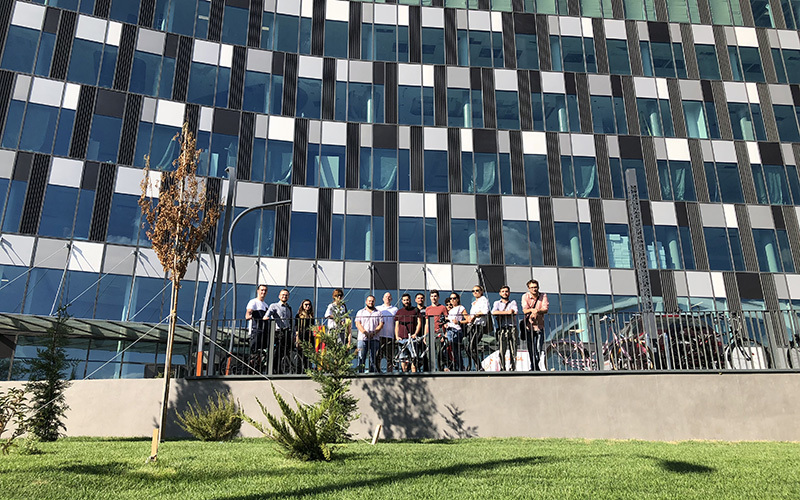 On Friday, 14 September 2018, the staff members of VCE Bucharest visited the Orhideea Tower in Bucharest in the scope of an office excursion. VCE Romania has worked as designer and consultant for Porr since the beginning of the project and will be entrusted with as-built documentation up to the completion of the project. Investment and Partnership Forum "Turkmenistan – Heart of the Great Silk Road"
The Investment and Partnership Forum "Turkmenistan – Heart of the Great Silk Road" was held in Vienna on September 5-6, 2018. 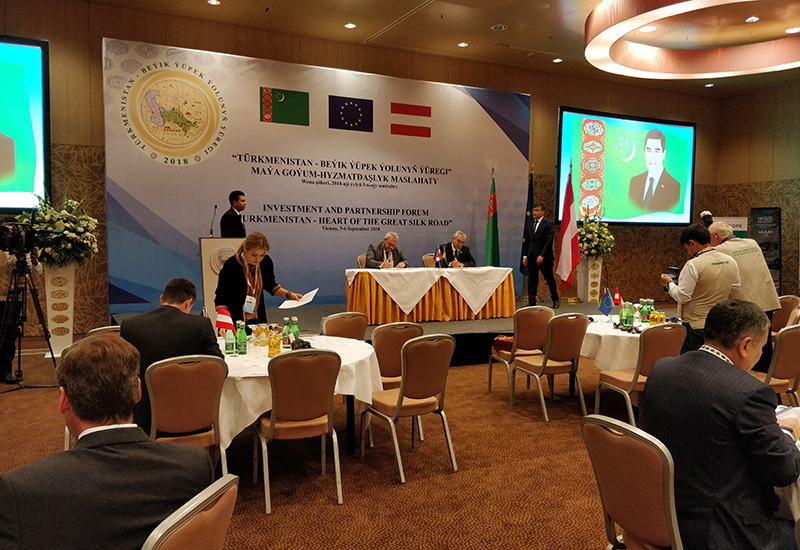 On this occasion VCE signed a contract on the further cooperation in the infrastructure area with Turkmenian investors. We are looking forward to the cooperation! 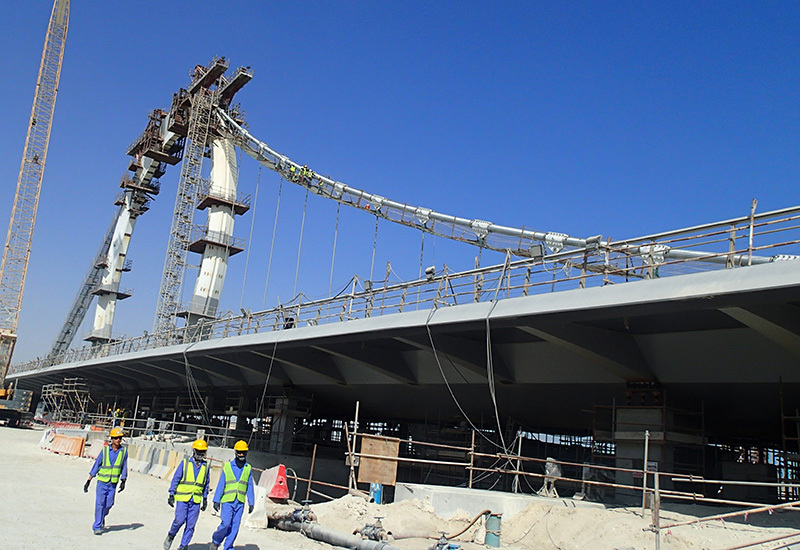 Ongoing Loadtest on Lusail Marina Bridge No.8 in Katar - VCE Permanent Structural Health Monitoring system is working perfectly! With a total output of 714 MW, the world's most efficient offshore windfarm will be built off the east coast of the UK. The windfarm consists of 102 7MW turbines and an offshore transformer station built on jackets at a water depth of 37 meters. 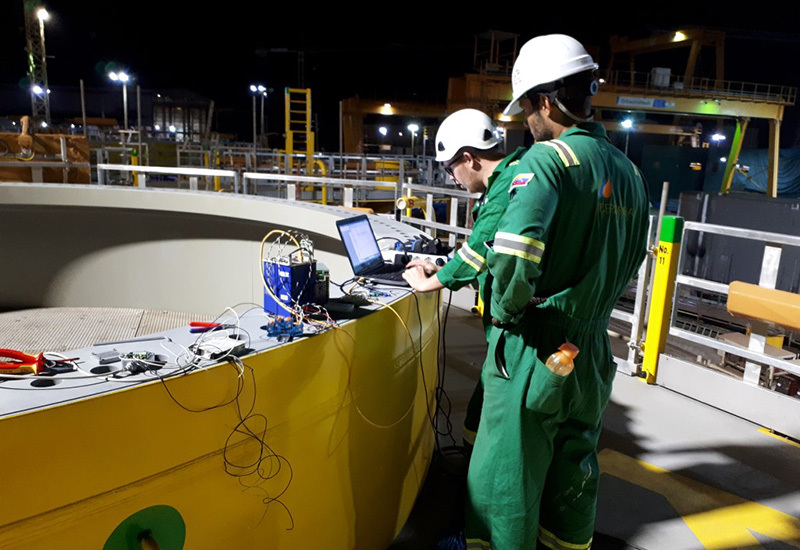 VCE was commissioned with the planning, installation and commissioning of a metrological condition monitoring system for nine turbines and the transformer station. This includes the installation of numerous sensors in the jackets (foundations), the towers of the turbines and the offshore station, including associated measurement technology, remote data transmission, automated data analysis and web user interface. On 2 June 2018 the Life Ball celebrated its 25th anniversary under the motto “Sound of Music”. 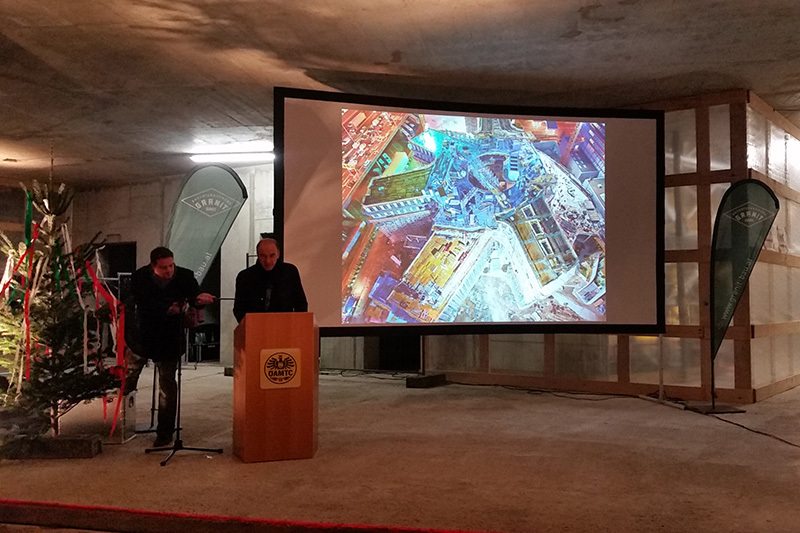 VCE supported the initiative with the free-of-charge service of design and building site coordination according to the building site coordination law for the “event site” Life Ball 2018 in the area of Rathausplatz and in the event rooms of the city hall. 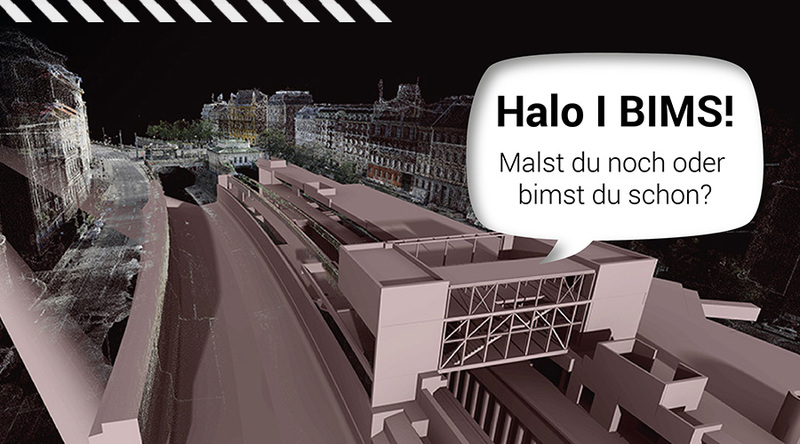 We kindly invite you to our annual BIM event under the slogan "Halo I BIMS!" 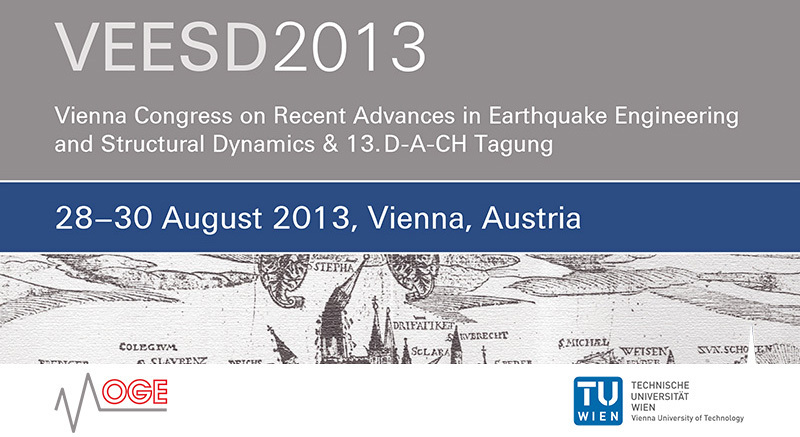 on 13 June 2018 in Kuppelsaal of the Vienna University of Technology. We would like to show you the latest developments and future trends of digital design in selected expert presentations. Please register by e-mail to linsbauer@vce.at by 6 June 2018. > PDF . Invitation "Halo I BIMS!" 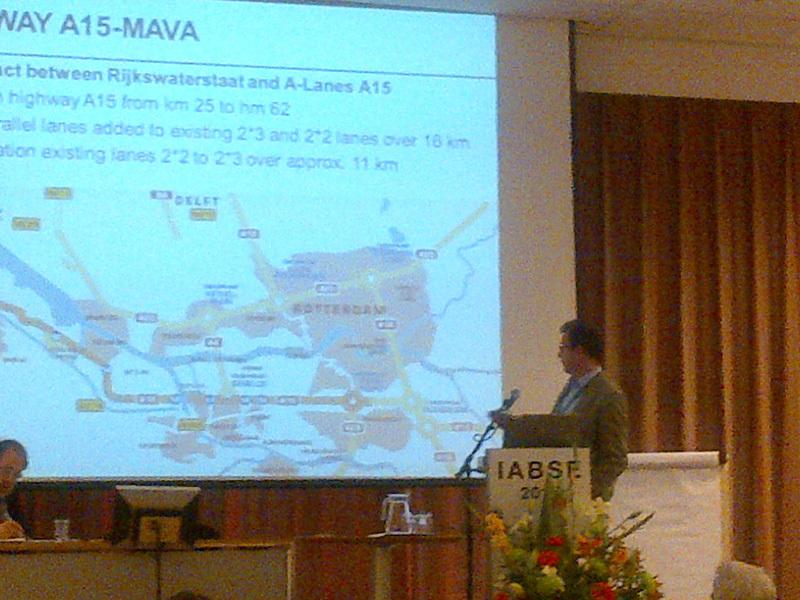 Günther Achs (VCE) attended the IABSE Conference Kuala Lumpur 2018 with his paper on"Innovative Ballast-less Track System for Urban Areas". Apart from the establishment of a hotel and flats in the existing structure the attic shall be converted. 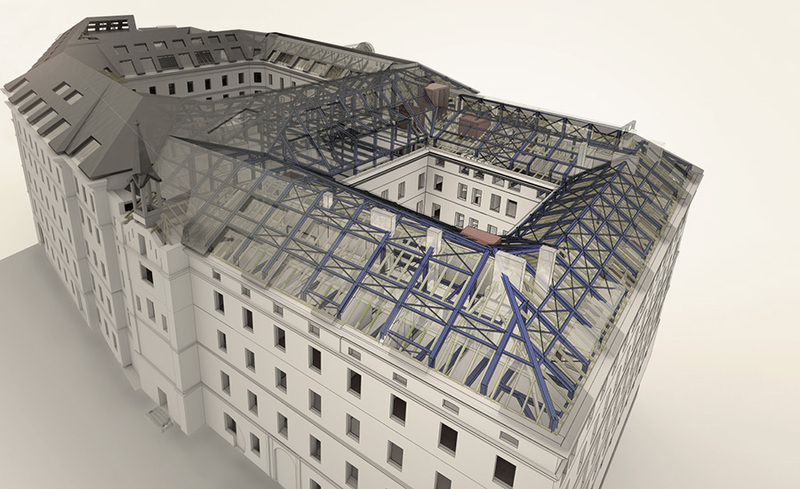 In this process the existing roof structure shall be maintained and an underground car park shall be built in Dominikanerhof. Furthermore respective installations are established in all courtyards. Due to the complex design the project is processed with BIM by VCE. 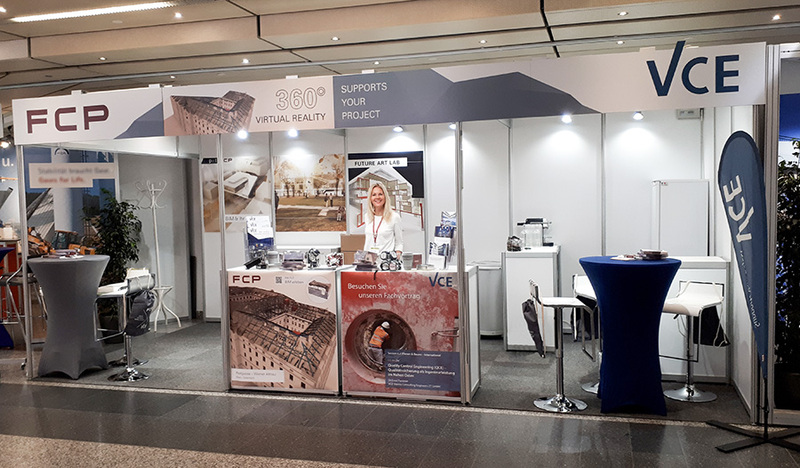 The Construction Congress 2018 is over and the FCP.VCE stand was a well visited meeting point of business partners and clients, students and pupils. 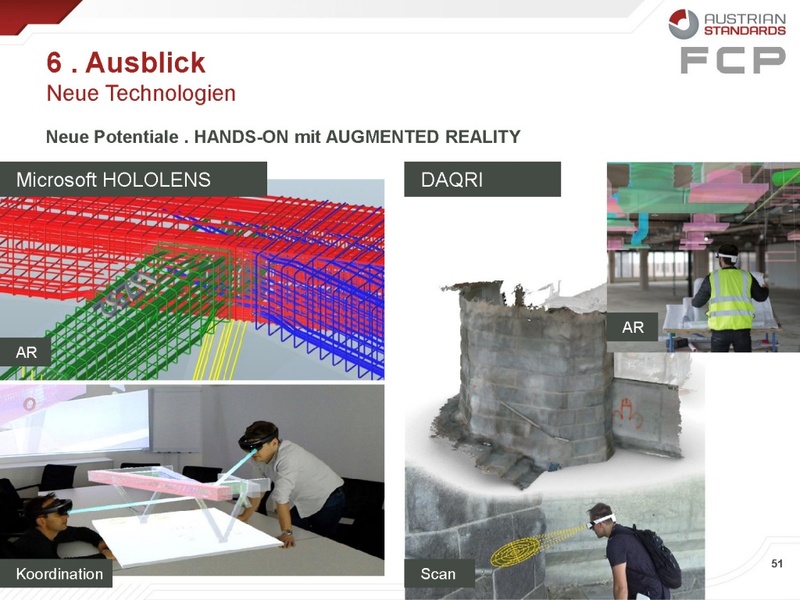 A special highlight of our stand was the introduction of our project Future Art Lab by means of virtual reality glasses under the motto “Experience BIM with FCP.VCE”. The expert presentation by Ernst Forstner “Quality Control Engineering (QCE) – Quality Assurance as Engineering Service in the Middle East“ within the session “Planen & Bauen – International“ (Design & construction – international) demonstrated our know-how once more and excellently completed the total performance at this year’s construction congress. 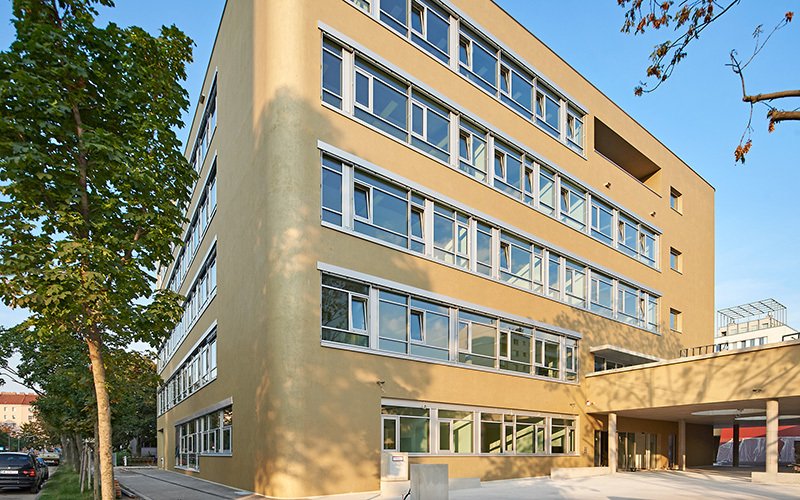 There are 12 classes of an open secondary modern school in Carlbergergasse 72 in 1230 Vienna, which was built in 1999. An annex to the existing school building will be realized for the creation of additional rooms. 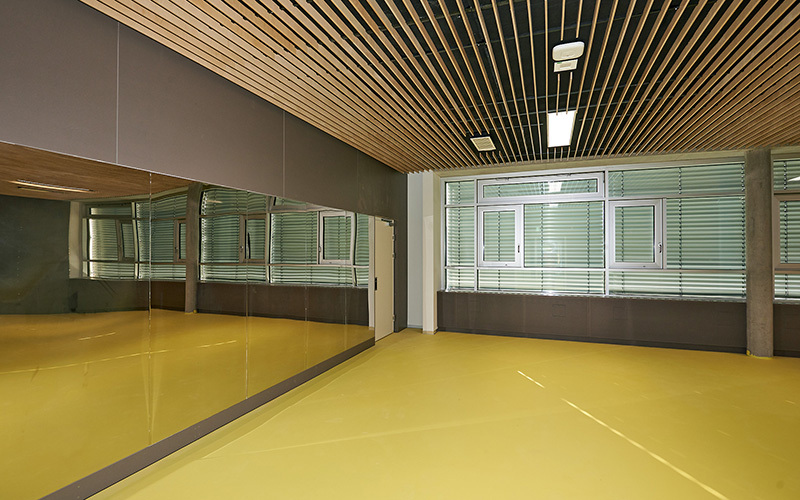 The annex comprises the new construction of 9 elementary school classes with all-day care including side rooms and an underground gym hall as well as the extension of the existing secondary modern school by 4 classes including side rooms. The open areas of the school are appropriately designed for pupils and instruction. The annex is situated on the available hard court so that it can be connected to the existing building on two sides. The project is in the basic design stage at the moment. Construction start is planned on 15 October 2018. Operation of the newly erected school building shall start in August 2019. 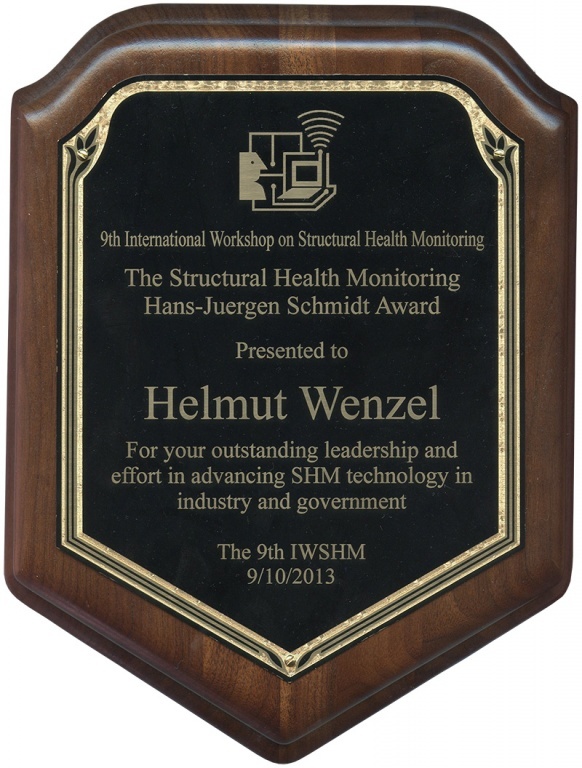 Structural Health Monitoring System & Load Testing . 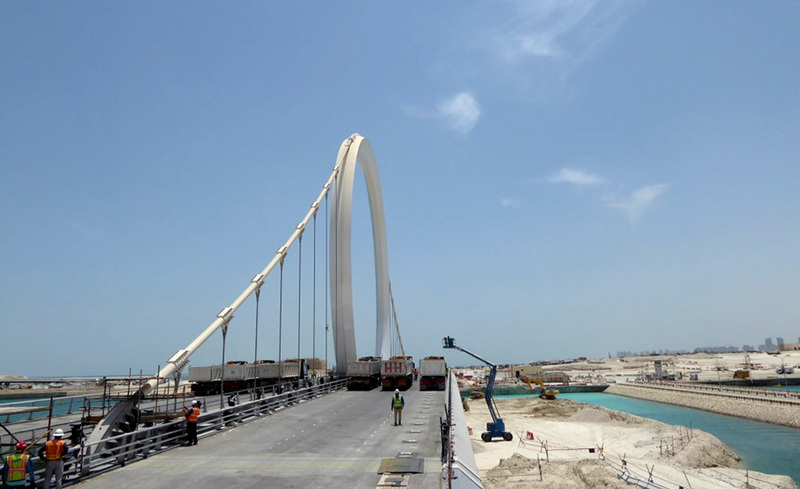 Two suspension bridges with O-shaped pylon are erected in the scope of the “Lusail Development Project”. The lengths of the two bridges amount to 204 and 186 metres. Both structures have six lanes each. Problems arose in the course of erection, construction was stopped and the structures were partly demolished again. 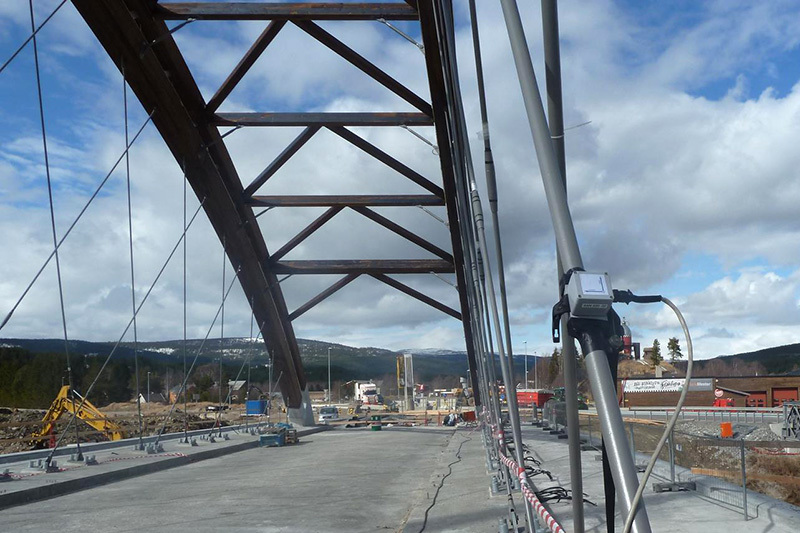 After redesign by the designer VCE was ordered to design, install and operate a permanent monitoring system with numerous sensors on the structure for the construction phase of one of the bridges. The objective is measurement and monitoring of the structural behaviour during construction and the examination of the planning assumptions. 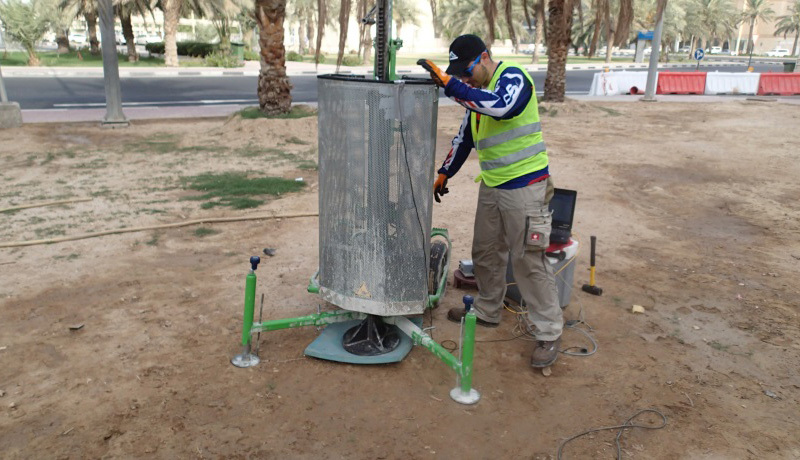 The services also include the measurement and instrumentation of a terminal static load test. 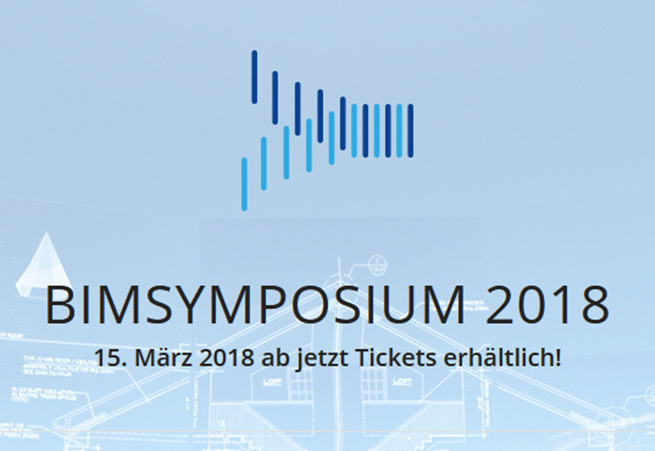 In the scope of the BIM-Symposium on 15 March 2018 in Schönbrunn Castle top-class speakers will assemble on the topic Building Information Modeling already for the third time. 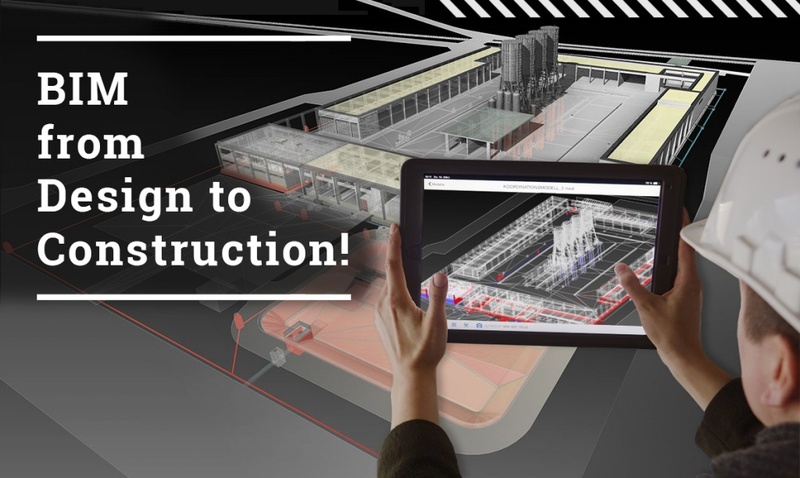 FCP.VCE, as one of the leading companies in the application of BIM technology in Austria, will hold three presentations at the symposium. 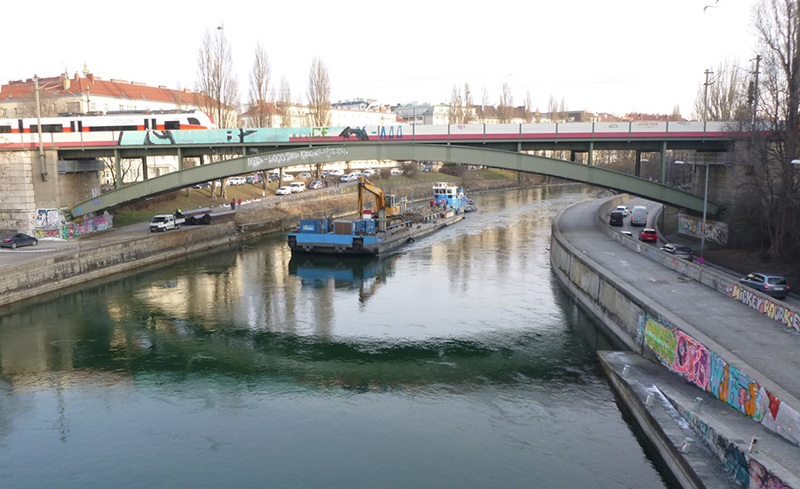 The extension / rehabilitation of the Voest bridge in Linz started at the beginning of 2018. 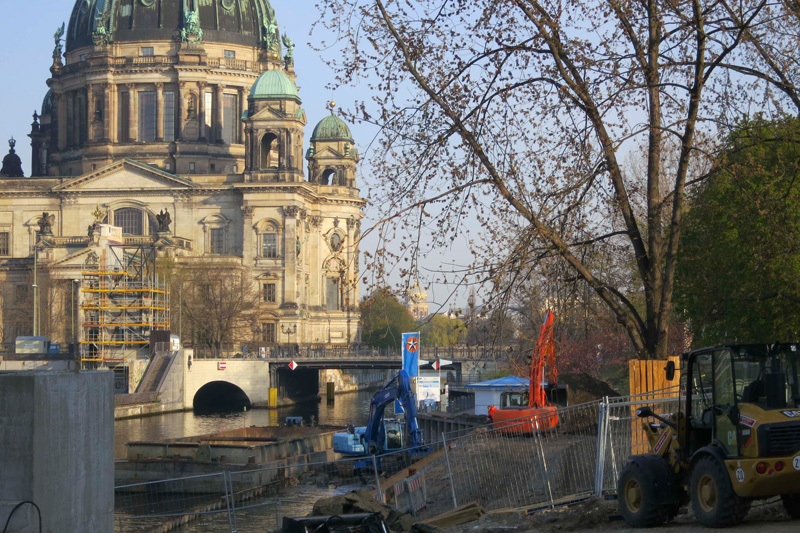 Two bypass bridges were erected and a multitude of further objects were reconstructed or newly built (bridges, underpasses, abutments) in the first section in lot AST Hafenstrasse – Junction Urfahr. 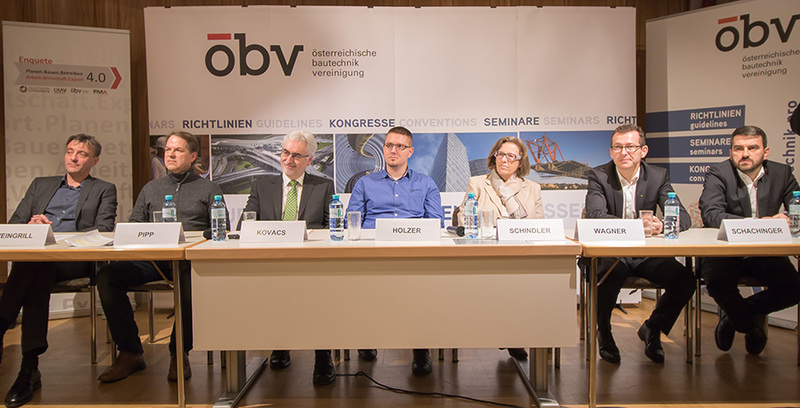 The Austrian Society for Construction Technology (öbv) organized a discussion forum on Building Information Modelling in structural engineering and HVAC on 23 January 2018. Michael Pauser (öbv) asked representatives of clients, facility managers, designers, HVAC experts and contractors to answer questions from the audience. One of the experts who answered questions was René Holzer from VCE. As of the 1st January 2018 we are pleased to welcome a new member to our management board. 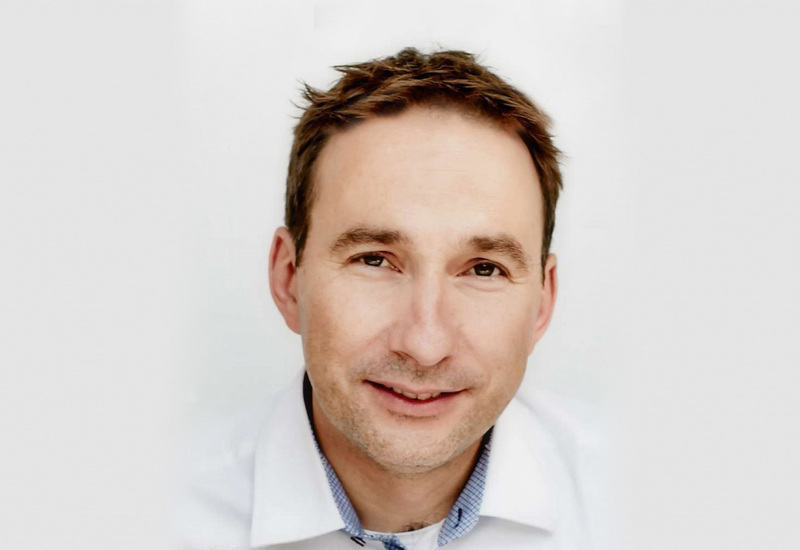 Wolf-Dietrich Denk is a very experienced structural engineer and has been appointed as a new managing director. We are looking forward to his expertise helping to develop and strengthen the future of our company. Civil engineering structures must be regularly subjected to complete visual and close condition tests regulated in guidelines, rules and standards. 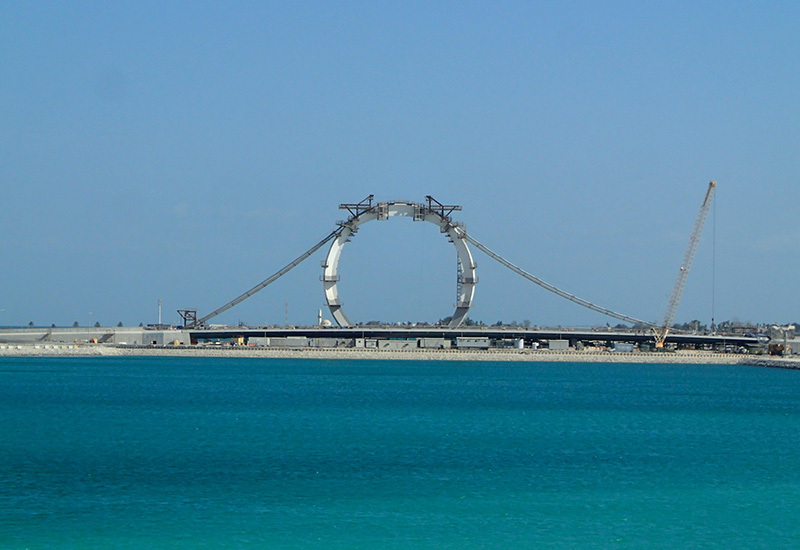 In particular in case of big bridges this is only possible in a limited manner and is connected with high efforts and expenses for access technology and operational constraints. 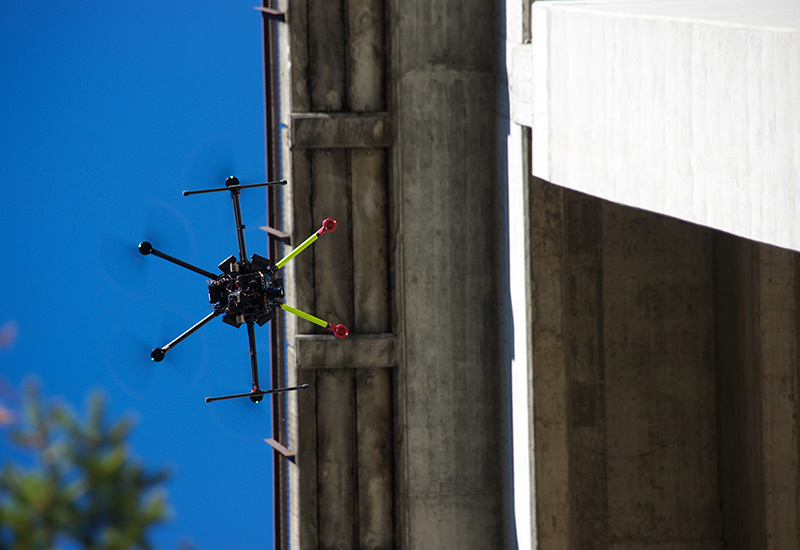 The objective of the EDISON project is the support of conventional bridge inspections and the (partial) replacement of the latter by use of unmanned aerial vehicles (UAV). In the project various UAV based sensor systems (e.g. high-resolution cameras, multi-spectral cameras, stereo cameras, ground radar, thermography) were further developed and tested at the Falkenstein railway bridge. Drink punch and do a good deed. 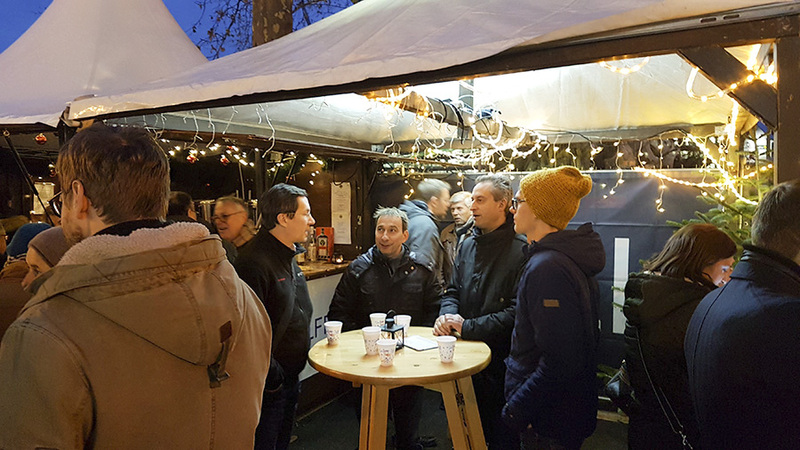 On 15 December 2017 VCE.FCP.BCT invited its clients to come to the charity punch booth of Lionsclub at Schwedenplatz, Vienna. VCE thanks for the pre-Christmas get-together and the great support of the activities of Lionsclub Wien Marc Aurel. 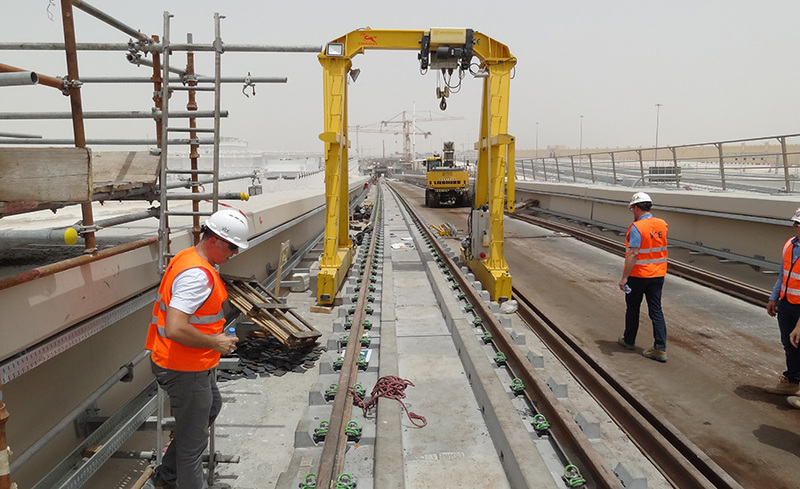 VCE carried out the track system in form of a ballastless track of the sections VDE 8.2 (in operation since 12/2015), VDE 8.1 Lot Centre and Lot South on a length of approx. 160 km. Rail instead of road transport – project for a faster and more effective transportation of container goods from the factory to the railway via freight vehicle without transaction at a terminal. 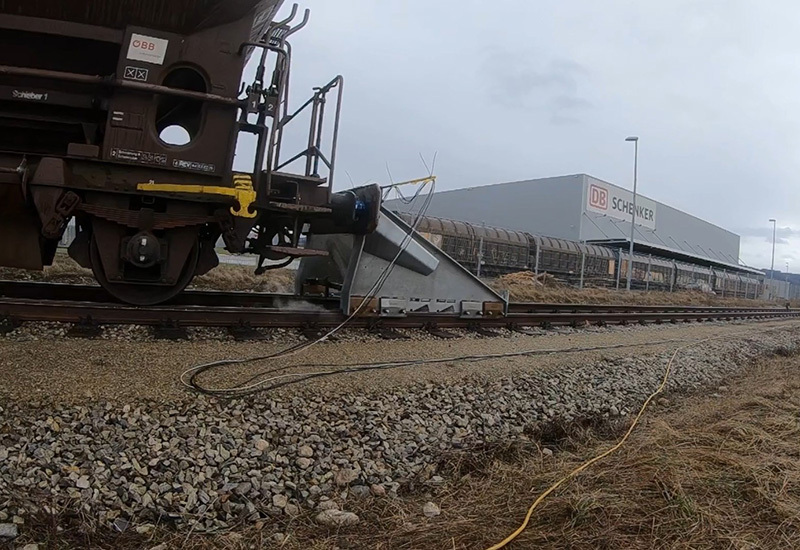 The first test transport of the combined freight transportation independent of a terminal was carried out in southern Burgenland (Austria) with the well-established MOBILER-System of the Rail Cargo Group. Containers can be handled quickly and straightforwardly between freight vehicles and railway-cars almost everywhere by means of special container shifting systems – by one single person, without any assistance and without costly terminal equipment. 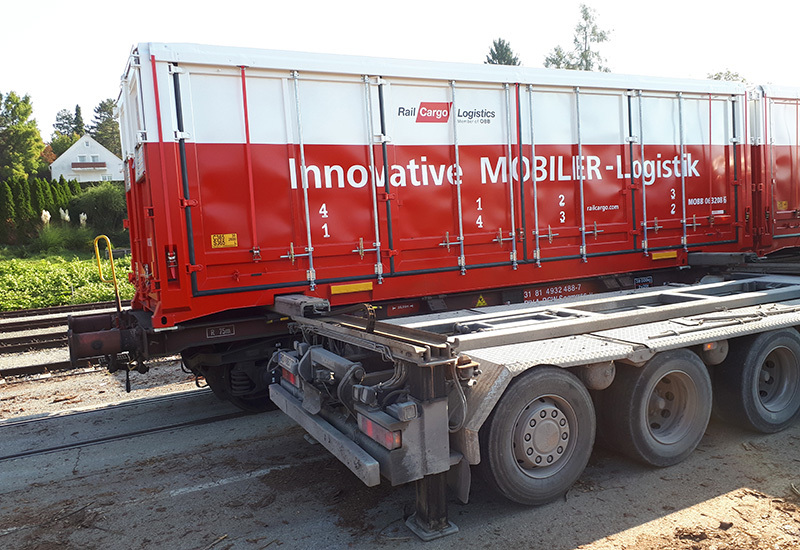 The project “Combi Coop II” was nominated as one the 5 top candidates of the 2017 VCÖ Mobility Award in the category “Energy-efficient freight traffic”. 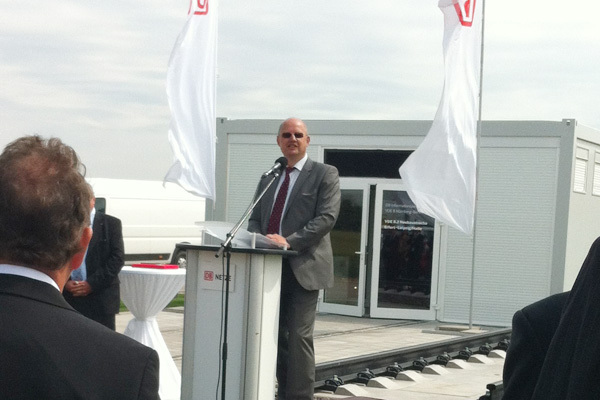 Project partners are nine companies from the southern Burgenland region as well as a forwarding company. For an improvement of recreational opportunities part of the existing park got a facelift by additional seating furniture and a small lake. In due time for the opening of the shared zone on Sunday, 17 September 2017, the reconstruction of the provincial vocational school and the object for assisted living were completed. 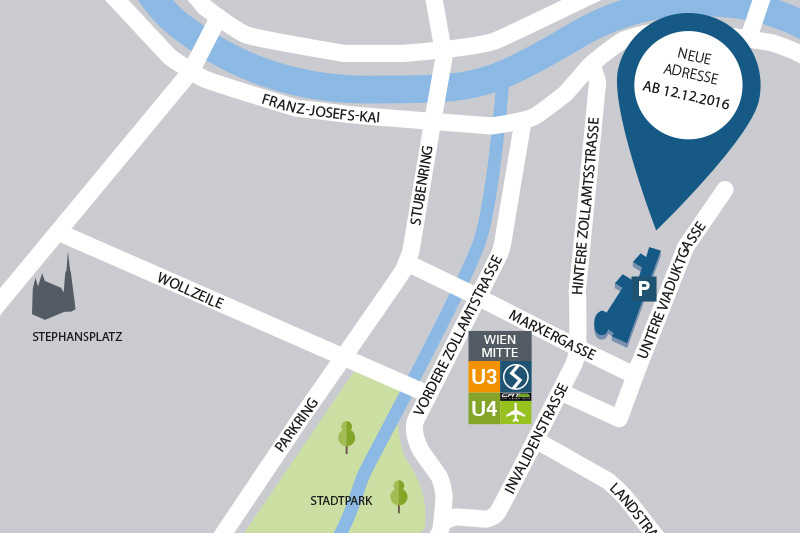 On 2 September 2017 the new extension of the underground railway line U1 will start operation with 5 new stations. VCE had the tasks of check engineer, railway consultant (§31a und §34b) and construction coordinator for lot U1/10 (Troststrasse), check engineer and railway consultant for lot U1/8 (Alaudagasse) and designer for lot U1/13 (turnout facility Favoritenstrasse). 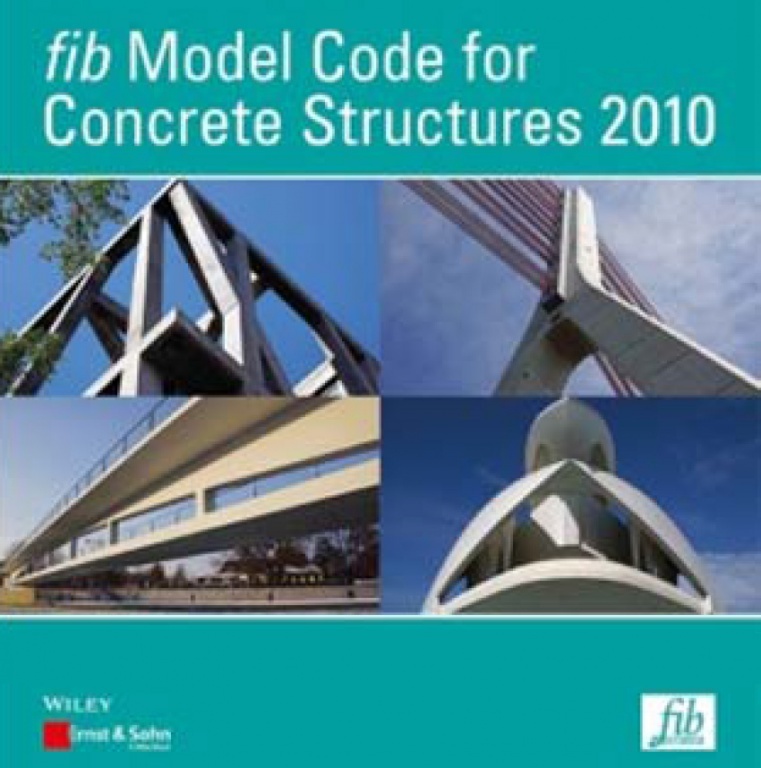 The construction methods comprised the whole spectrum of civil and underground engineering (earthwork, cut-and-cover method, bored piles, relocation of installations, underpinning and protective screen of buildings with jet grouting, tunnel construction with shallow excavated cross sections of up to 120 m² under existing buildings) as well as of interior fitting (steel construction, glass structures, masonry) and could be successfully implemented meeting the respective deadlines. 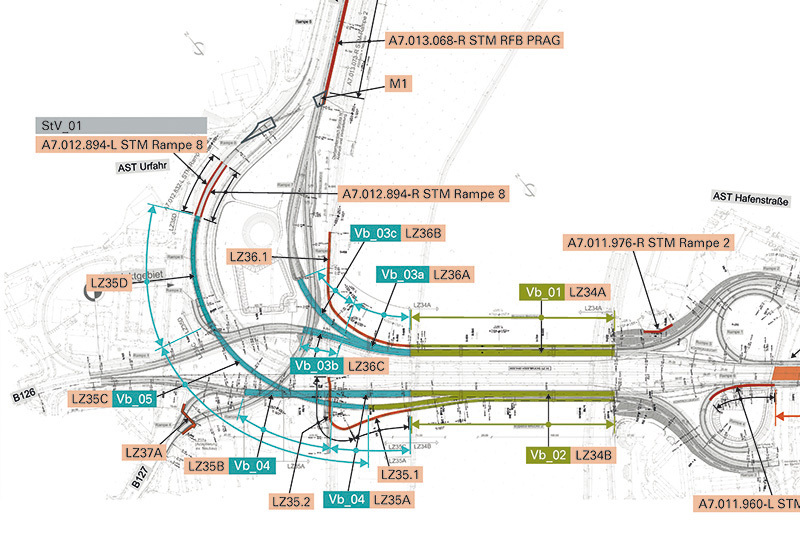 The scope of services of VCE also comprised track design in the area of the turnout shaft Volkspark (U1/8), noise and vibration protection design of the lots U1/8 and U1/13 – U1/15 as well as traffic design in the area of the lots U1/13 – U1/15. The project Meerwind South / East consists of the two offshore wind parks Meerwind South and Meerwind East, which were planned and constructed 23 km north of Helgoland island in the North Sea and are maintained from Helgoland. The wind park comprises a total of 80 wind energy plants with a performance of 3.6 megawatt each. The network is supplied with a performance of up to 288 MW via a transformer platform. The foundations (mono-piles and transition pieces) of all 80 wind turbines are equipped with a condition monitoring system by Airwerk GmbH for permanent condition monitoring and monitoring of the ageing behaviour (fatigue). All measurement data are transmitted to an onshore server, analysed by software routines and all results are made available to the client in a web-user interface. The project provides for the new construction of a school for children aged 6 to 14 as well as an annex to an already existing elementary school building. 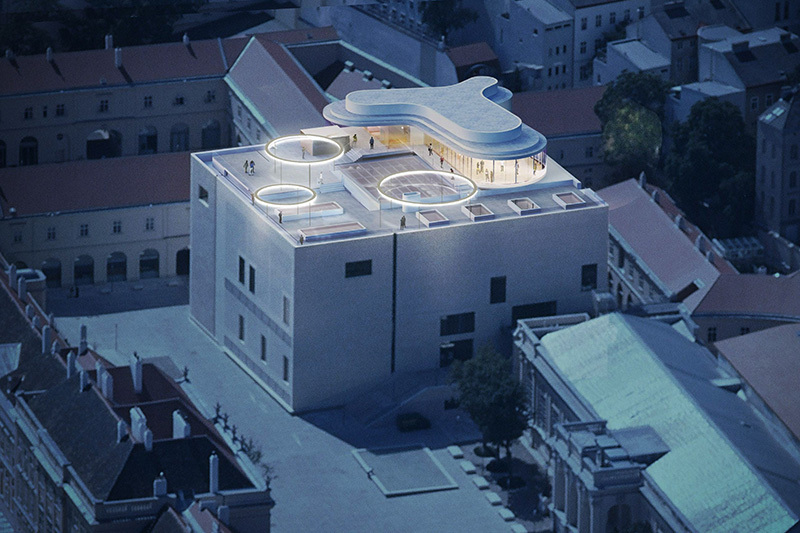 The new school for 6 to 14-year-olds is designed as compact structure with five floors. Attached to the back side is a structure with two half-buried gym halls. 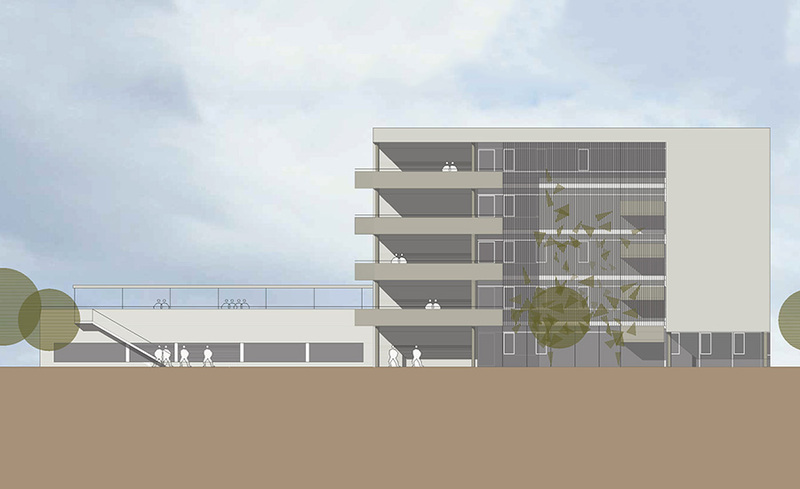 A side wing consisting of a waste disposal room and a flying roof creates an atrium as well as a rest zone on the flat roof of the first floor. The open spaces of the school are suitably designed for pupils and instruction. 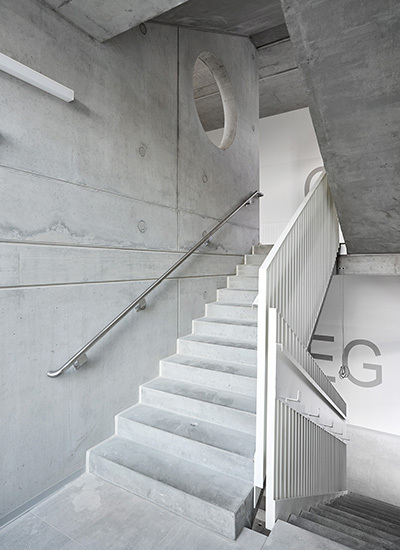 The three-storeyed structure of the annex to the elementary school is compactly connected to the existing building and complements the available space with the required educational and secondary rooms. 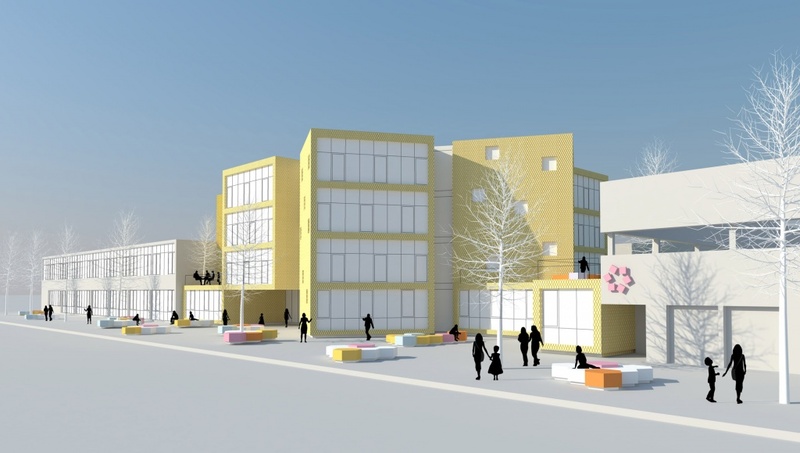 Both school buildings are currently in the detailed structural design phase. Construction will start on 17 July 2017. In the course of the Austrian Steel Construction Day in Graz the winners of the 6th Austrian Steel Construction Award were announced. 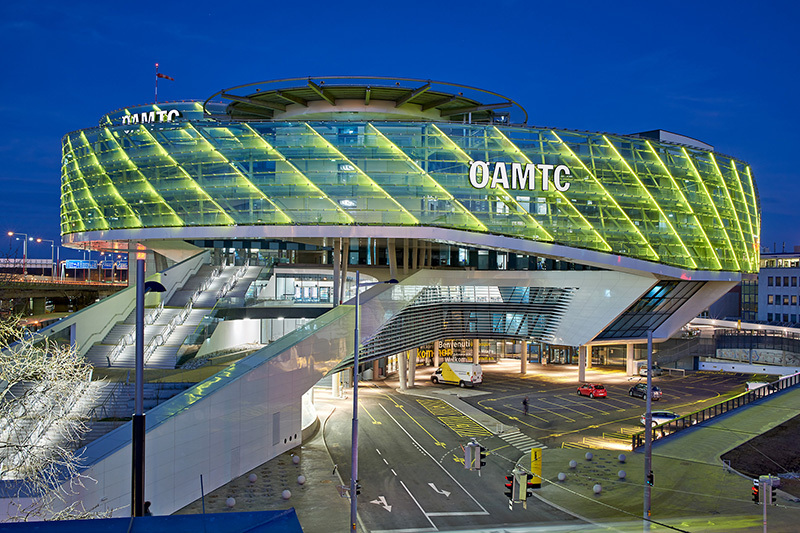 The prize was awarded to the ÖAMTC headquarters in Vienna. 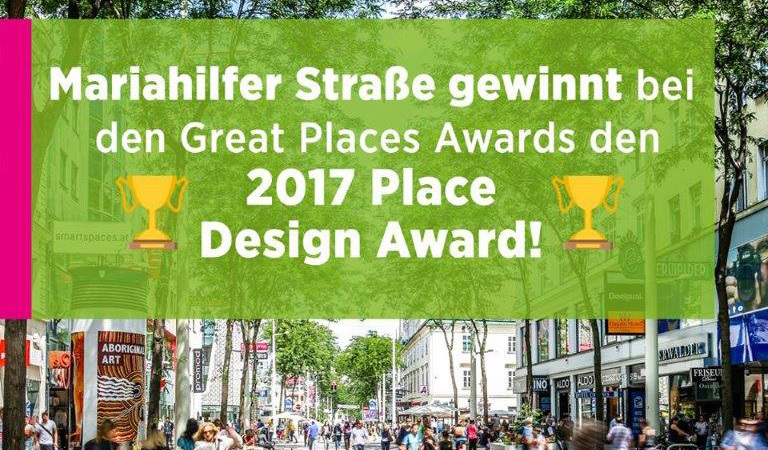 Mariahilfer Strasse wins “2017 Place Design Award”! The EDRA Great Places Awards recognize professional and scholarly excellence in environmental design and pay special attention to the relationship between physical form of the built environment and human activity or experience. The 2017 Place Design Award goes to Mariahilfer Strasse in Vienna—a previously traffic-heavy 19th century shopping boulevard that has been transformed into an inviting, pedestrian-friendly avenue. 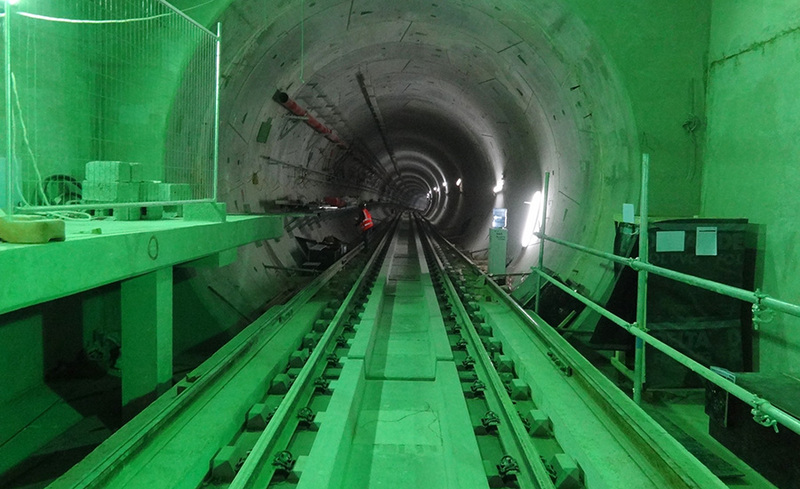 Four underground railway lines are being constructed on a total length of 172 km in Doha, Qatar, in the scope of phase 1 of the Doha Metro project. 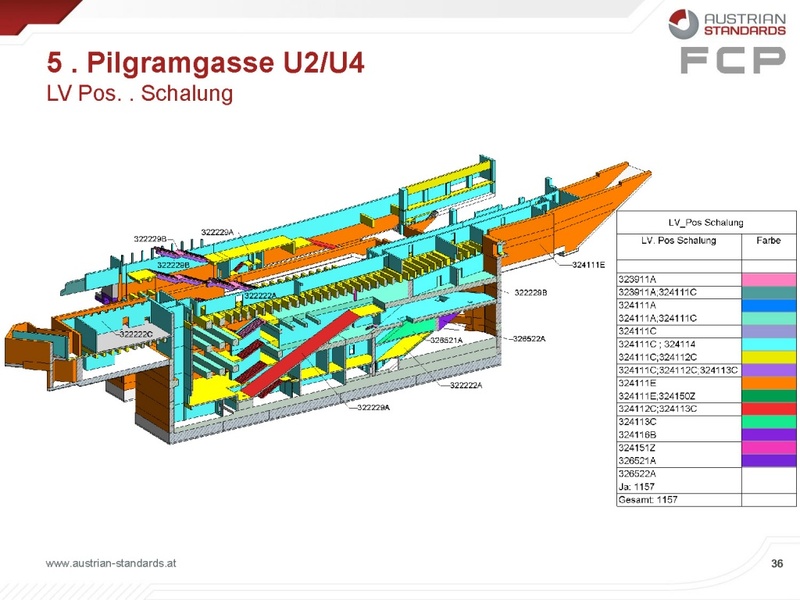 At the end of May track slab design was approved by the Design Verification Engineer DVE. Furthermore the noise and vibration assessment was completed and the effectivity of the mass-spring systems was verified in a 1:1 in-situ test. The track system is currently under construction. It is designed as ballastless Porr slab track system including light and heavy mass-spring systems as required. All in all approx. 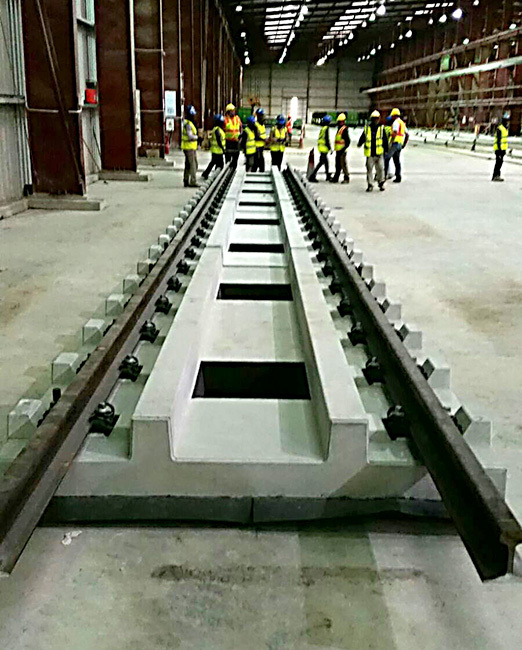 80% of the precast track slabs have been already produced and are being installed continuously. The section comprises tunnel, at-grade and bridge sections. 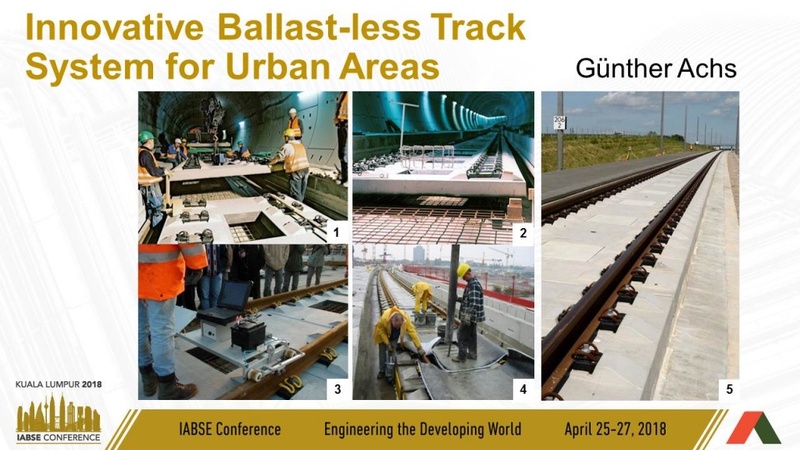 In addition turnout areas and the associated transition areas on ballastless track were developed and planned. 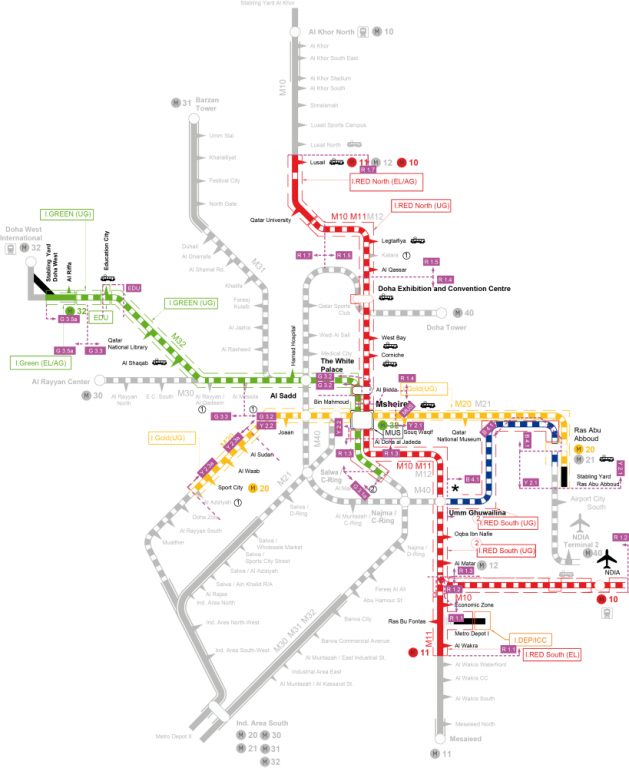 The track design was revised and adapted for the installation of the slab track system. VCE carried out noise and vibration assessment determining emission reduction measures (e.g. mass-spring systems) for providing the protection targets regarding vibrations, ground-borne noise and airborne noise. In order to verify the effectivity of the proposed mass-spring systems, true size mock-ups were installed, tested and their performance was verified. The section of Phase 1 is to be put into operation in 2020, in due time before the start of the Football World Cup in 2022. 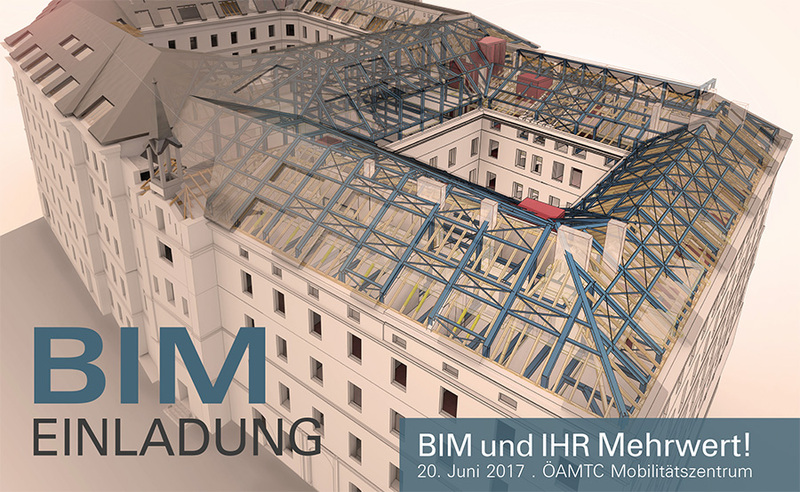 VCE invites you to the BIM event "BIM und IHR Mehrwert" (BIM and YOUR added value) in ÖAMTC’s mobility centre on 20 June 2017. 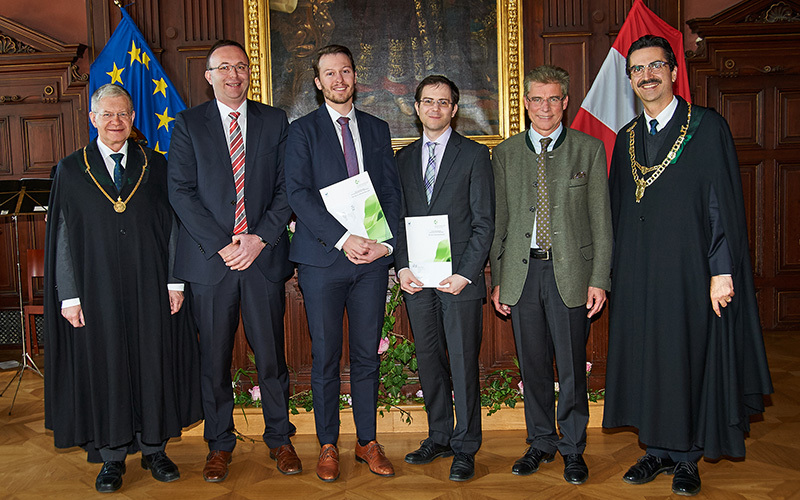 On Thursday, 11 May 2017, the VCE INNOVATION PRIZE for Excellent Research in Civil Engineering 2016 was awarded to Dr. Roman WENDNER and Dr. Johannes PISTROL at the University of Natural Resources and Applied Life Sciences in Vienna. This year the charitable association LIFE+ organizes the AIDS charity event “Life Ball“, which is recognized worldwide, again. National and international non-profit organizations, which support persons affected by HIV, are funded with the net profit of the Life Ball. This year’s topic #Recognize the Danger runs like a creative thread through the weekend of events and welcomes the visitors as oversize figure at the entrance of Vienna’s city hall. 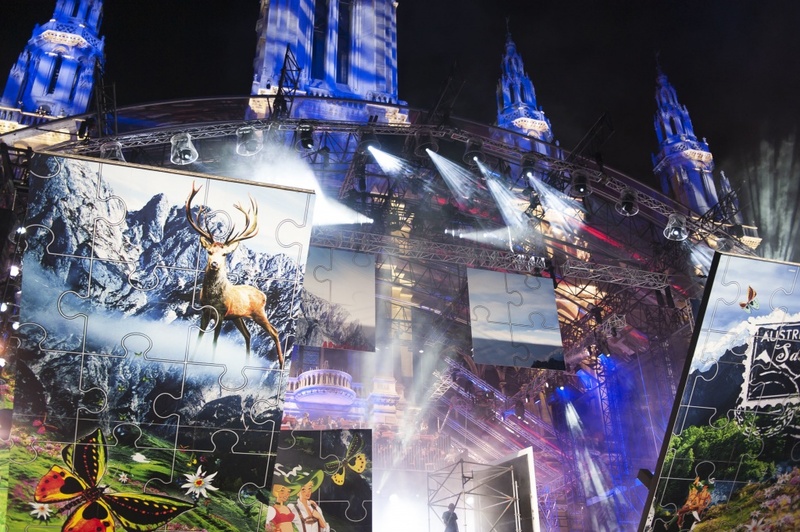 VCE supports the initiative with the service of design and building site coordination according to the building site coordination law for the “event site” Life Ball 2017 in the area of Rathausplatz and in the event rooms of the city hall. 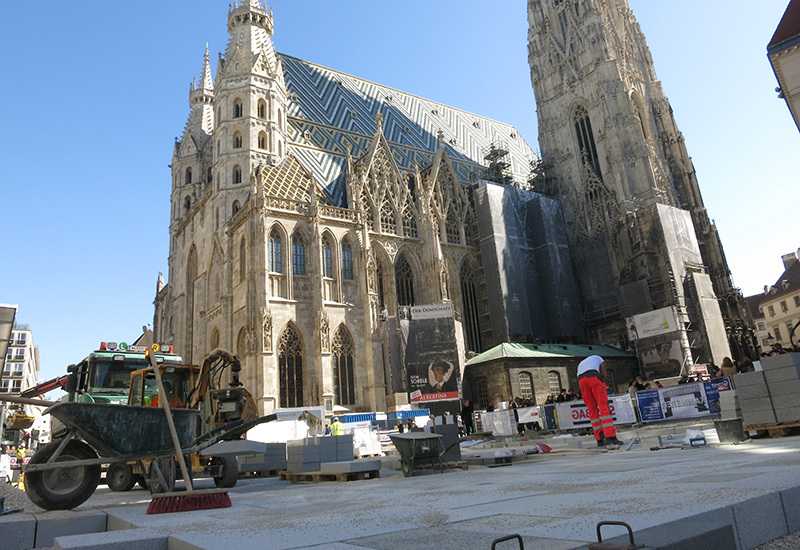 Stephansplatz is one of Austria‘s most prominent places due to St. Stephen’s Cathedral. Therefore this important central square shall be completely refurbished and its surface redesigned. For this purpose 36,400 granite slabs and stones are laid. In addition 1,500 t of asphalt concrete and 5,500 t of drain concrete are installed. Apart from surface assembly a second drainage level for the protection of the subterranean structures (catacombs and Virgil Chapel) is established. 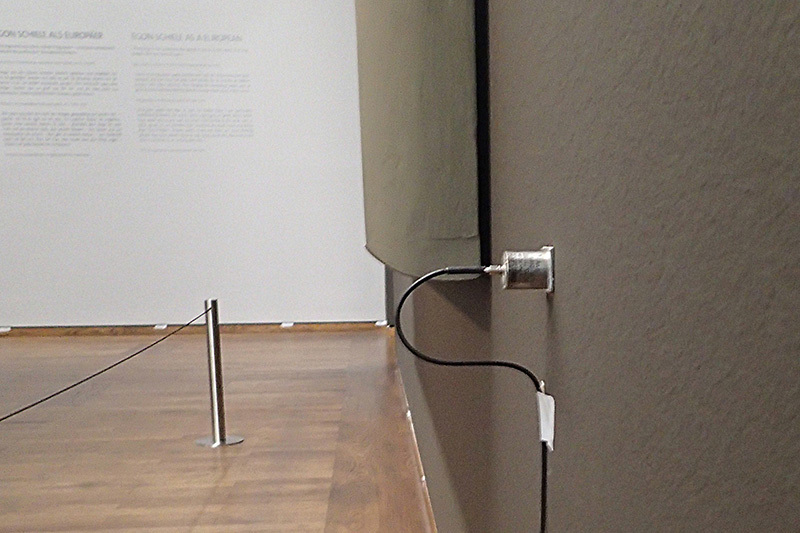 Furthermore, essential parts of the installations are relocated or renewed. The construction works started in March 2017 and shall be concluded by November 2017. Currently the project is in the phase of basic design with advanced submission of architectural design. Furthermore there is continuous coordination with the authorities and the Antiquities and Monuments Office. At the left bank of the Danube Canal, at river kilometre 7.355, serious settlements as well as material erosion due to scouring was determined for one abutment. Therefore a renovation of the side wall on a total length of approx. 130 metres was required. 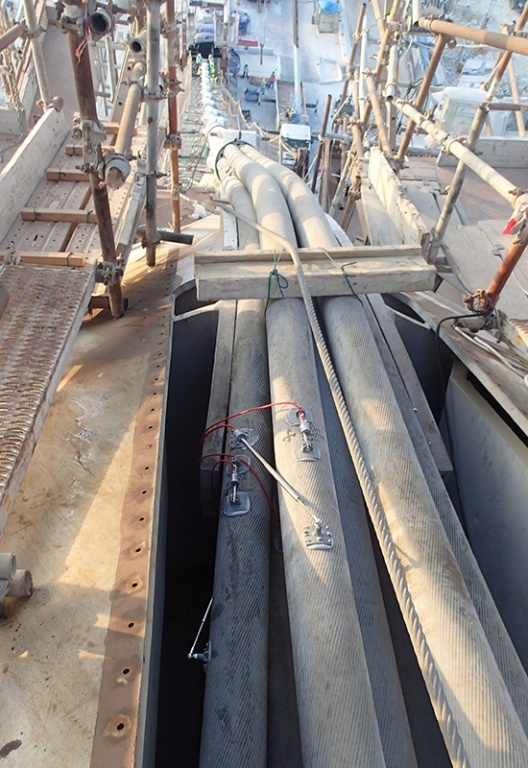 The remedial actions were implemented by an additional sheet pile wall. The new sheet pile wall shall be completed in March 2017. 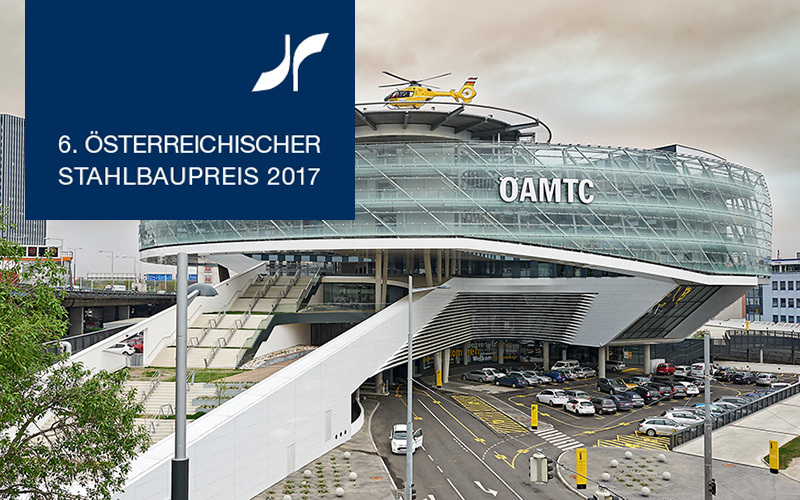 ÖAMTC concentrated the former eight administrative sites in Vienna in one new building with a size of 25,000 square metres and established new headquarters with an office area, support functions, member service and a heliport. The new centre shall take care of approx. 75,000 members and clients. 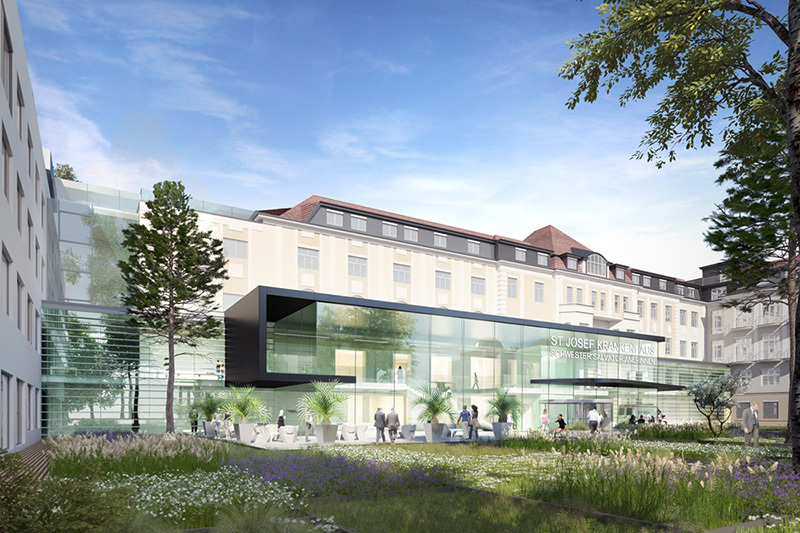 The project was handled by Pichler & Traupmann architects as general design managers in cooperation with VCE. 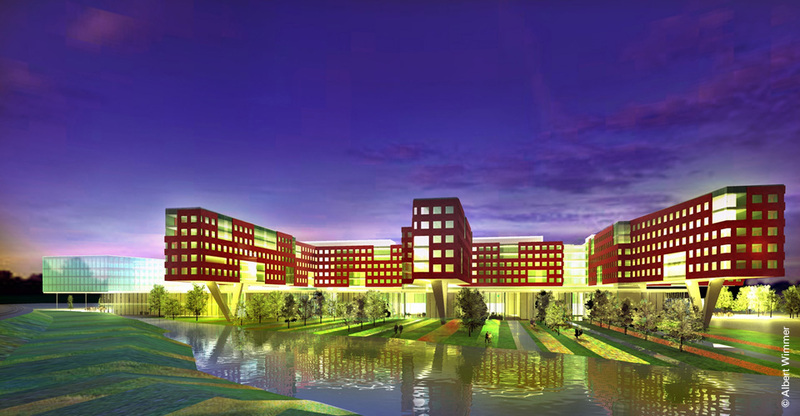 The building was continuously planned from preliminary design up to detailed design with a joint three-dimensional BIM model. 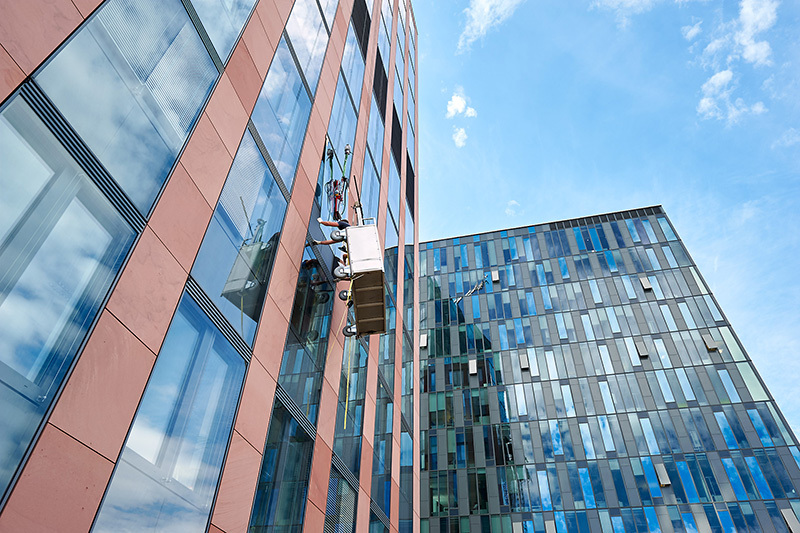 In the course of the maintenance of the building the exterior toughened safety glass panels of the facade were exchanged with laminated safety glass. All in all approx. 7,250 m² or approx. 2,850 glass panes were substituted. In parallel the total natural stone facade was inspected and refurbished. Furthermore safety measures regarding accessibility and guardrails were planned and implemented. We kindly ask you to update your database and are looking forward to welcoming you! Please note that our office cannot be reached by phone or e-mail between 7 Dec. 2016, 2 p.m. and 11 Dec. 2016 12 p.m.
We would like to inform you that the Austrian Steel Construction Association published the following announcement on the "European Steel Bridge Awards". 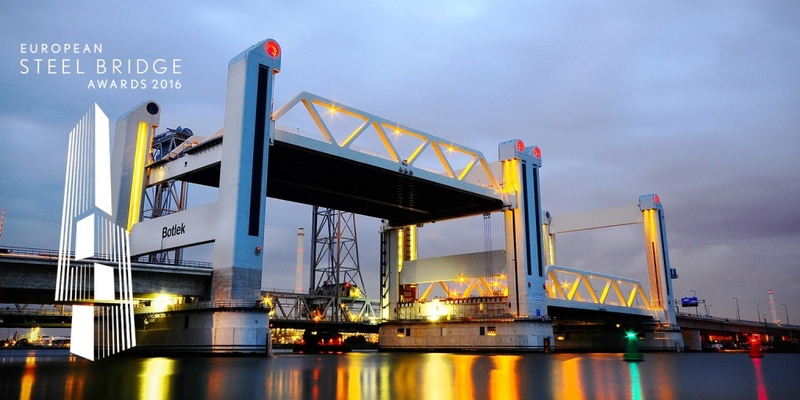 VCE received the Special Engineering Award of the ECCS for outstanding consultancy and design services for the Botlekbridge in the Netherlands. In Vienna’s city region the noise of all roads, tracks and Integrated Pollution Prevention and Control (IPPC) sites is visually represented on two-dimensional coloured maps. Furthermore the noise levels at principal residences are determined and summarized in tables, separated according to the sound source. The calculation comprises the total urban area of Vienna with 414 km² and contains more than 80 million calculation points. 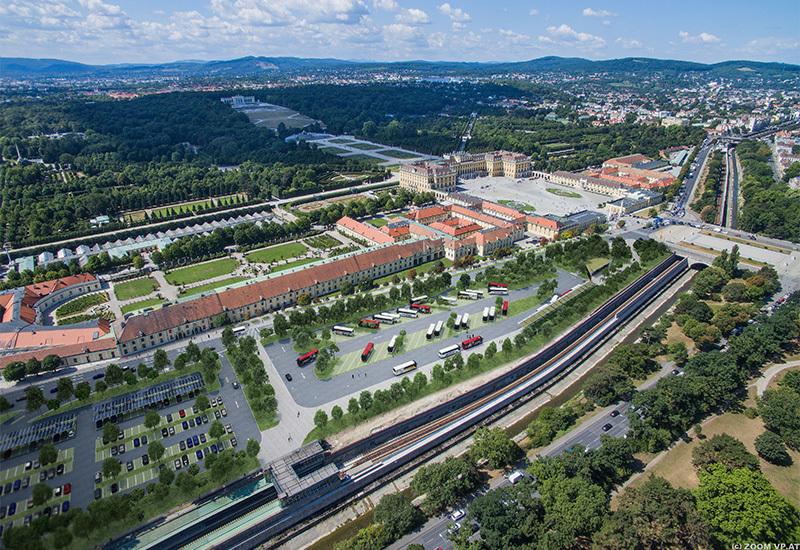 Rail sources in Vienna’s urban area include ÖBB rail tracks, underground railway and tram lines of Vienna’s public transport services and tracks of local railway lines. Motorways and express highways as well as general public traffic routes in the city area are considered as road sources. In the city area of Vienna there are 28 IPPC sites (as of 2012), which are also displayed in the strategic noise maps. 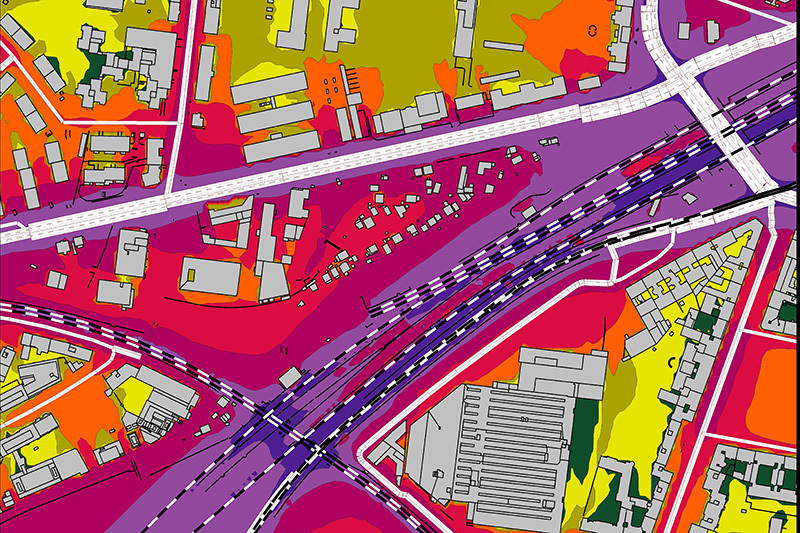 Services: noise mapping, acoustic calculations of railway, road and site noise. 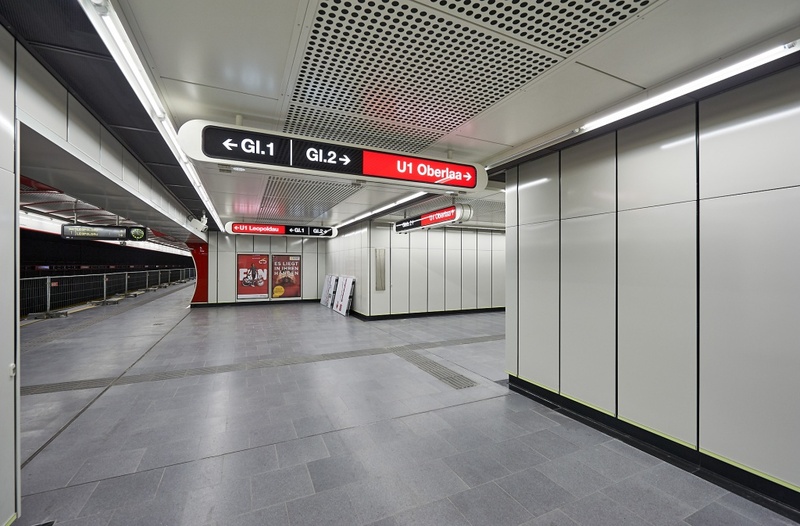 The project “Lückenschluss U5” extends the previous U5 Line from Alexanderplatz to Brandenburger Tor and merges it with U55 there. 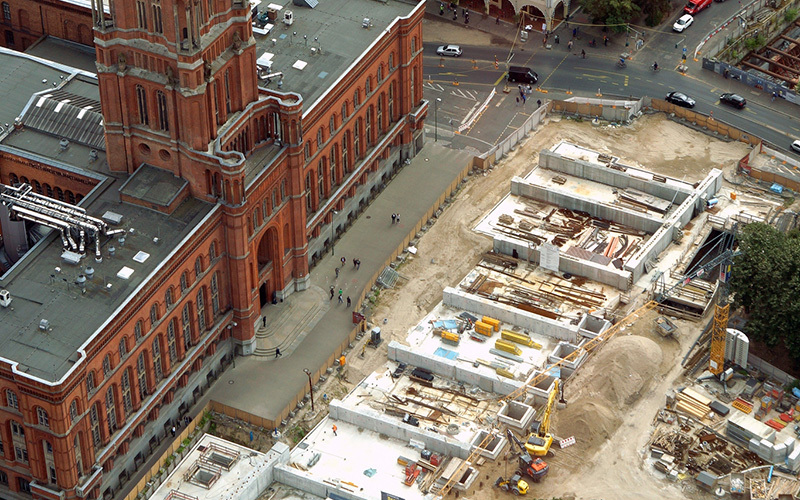 Apart from 2.2 kilometres of tunnel routes, three new railway stations “Unter den Linden“, “Museumsinsel“ as well as “Rotes Rathaus” are constructed in the centre of Berlin. Seven centrally arranged supports carry a major part of the floor load in the station “Rotes Rathaus“. The column heads look like mushrooms due to their funnel shape and shall remind of the old vault of the medieval town hall. Construction works and surface restoration shall take place after the completion of the structural works. 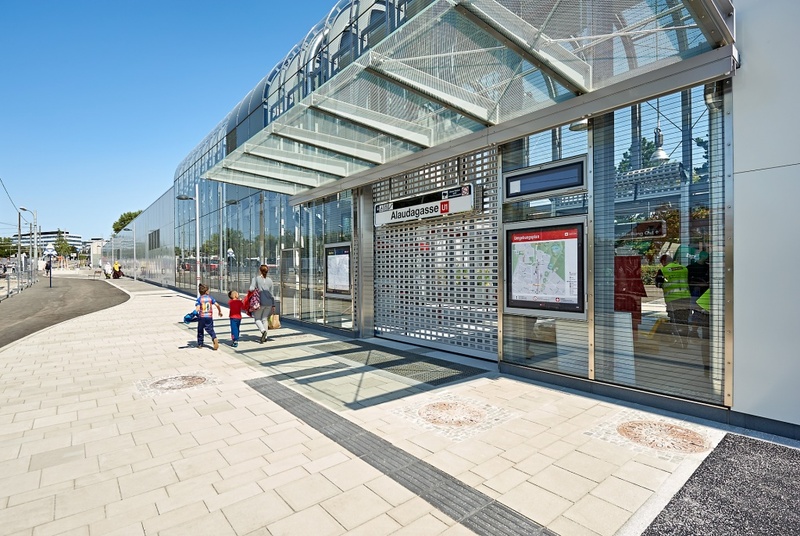 The opening of the total route of the U5 is expected in 2020. In the course of the structural survey of the Reichsbrücke it was detected that certain pot bearings had no sufficient sliding gap anymore. Therefore the existing pot bearings are dismounted and replaced with new cup and ball bearings in autumn 2016. The bearing exchange is carried out without any interruption of the traffic. 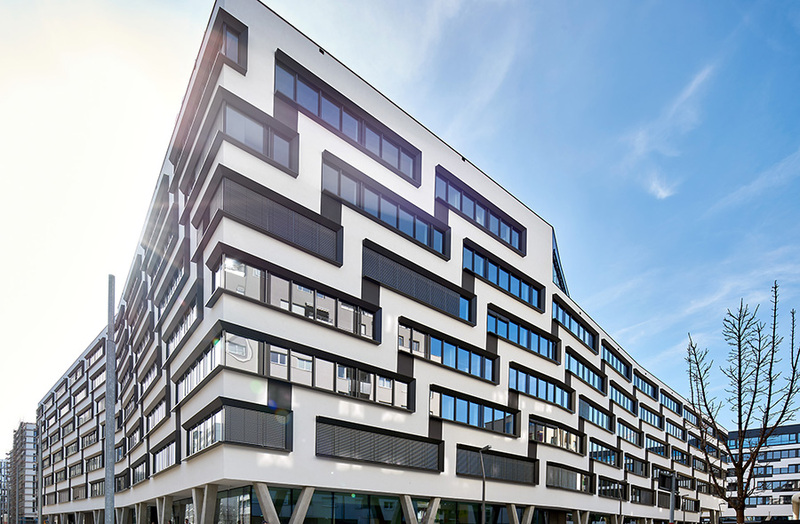 The new building of the administrative and production site of the company HOERBIGER in Seestadt Vienna-Aspern was inaugurated after two years of construction. A modern building was erected with the objective to bring together workers from production and employees from administration. 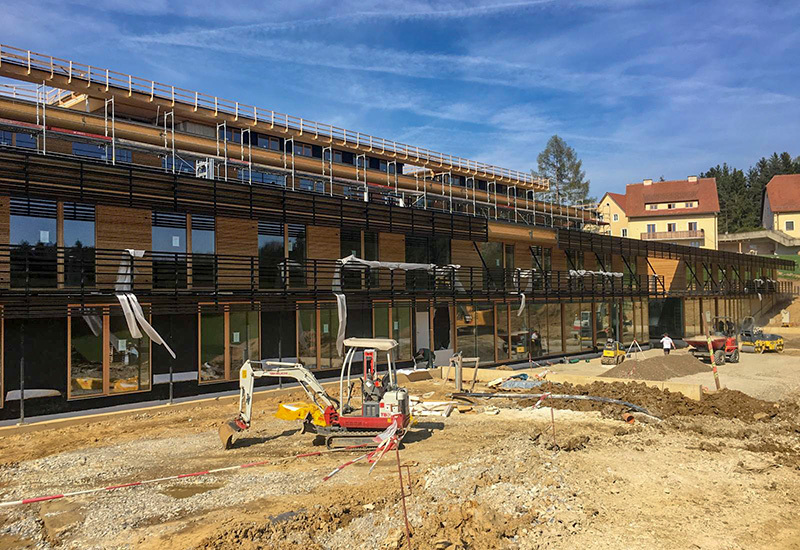 Due to the utilization and the ecological objectives requested by the city of Vienna (Total Quality Building [TQB]) high demands regarding planning were given. The building stands out due to its three cantilevers in the entrance area as well as the green atrium and the open architecture. 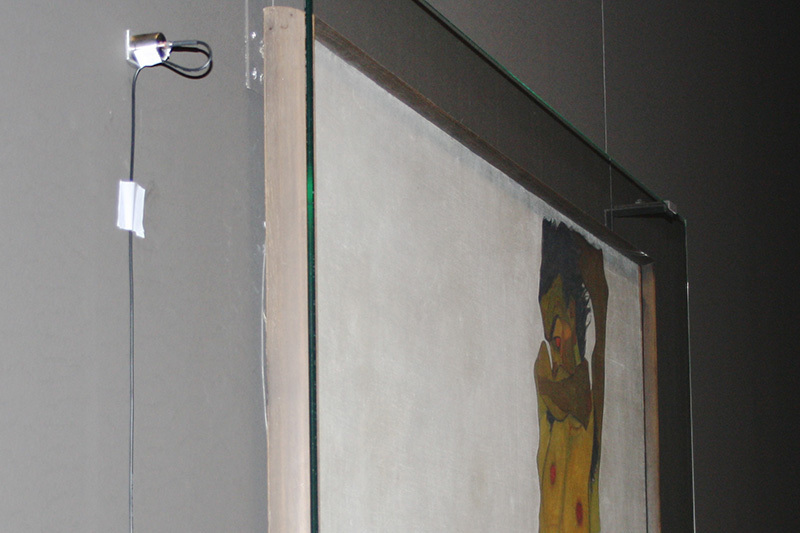 In this process the vibrations occurring were determined during test drillings at the facade of the Leopold Museum at the positions with paintings deserving particular protection (Schiele, Klimt). In coordination with the representatives of the client recommendations for safe assembly during the construction works were elaborated based on the results (relocation of especially critical objects, elastic storage of all wall paintings). to the Services "Dynamic & Vibration Protection"
The aim of the current investigation was the measurement-based determination of the effective forces of all 68 rods of the network arch bridge during the individual construction phases and 12 months after completion with BRIMOS® Structural Health Monitoring. The basis for investigation was geometrical information on all tie rods and the corresponding product specifications. According to the bending beam theory of mechanical engineering an analysis tool for the determination of the tension forces was established on the basis of the measured eigenfrequencies and applied in the course of the attendant dynamic construction element measurements. Ashghal (Public Works Authority), the Qatari authority responsible for all infrastructure projects, realizes the so-called IDRIS Programme (Inner Doha Resewerage Implementation Strategy) for comprehensive extension and fundamental modernization of the sewage system in Doha in order to cope with the requirements of the considerably growing population. VCE is involved as Quality Control Engineer (QCE) in the project LIS-03, the lot for the design and construction of the two interceptor sewers Mesaieed Industrial City (MIC) and Utility Corridor Lateral (UCL). 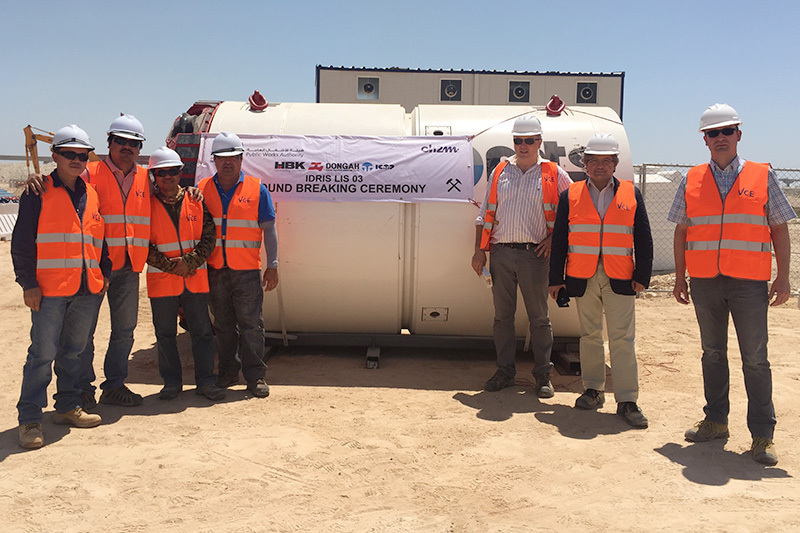 In this project four micro-tunnel boring machines are used for the construction of the deep gravity sewer with an internal diameter of 1.6 m and a total length of approx. 21 km. All in 47 shafts with depths up to 45 m have to be established for the operation of the micro-tunnel boring machines and installation of the jacking pipes. The services as Quality Control Engineer comprise the review and the approval of the design as well as the quality control in construction. 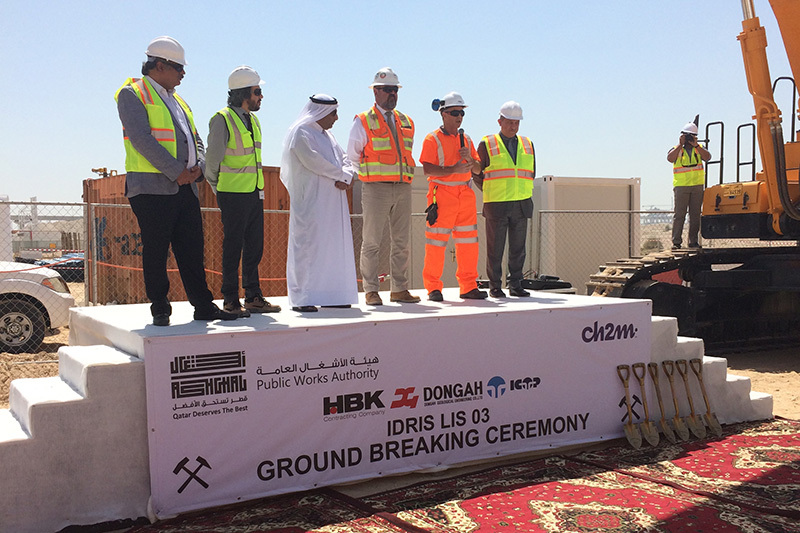 On 27 April 2016 the ground-breaking ceremony for the first shaft took place in Al Wakrah. After numerous adjustment processes the road surface project Herrengasse was released for implementation. 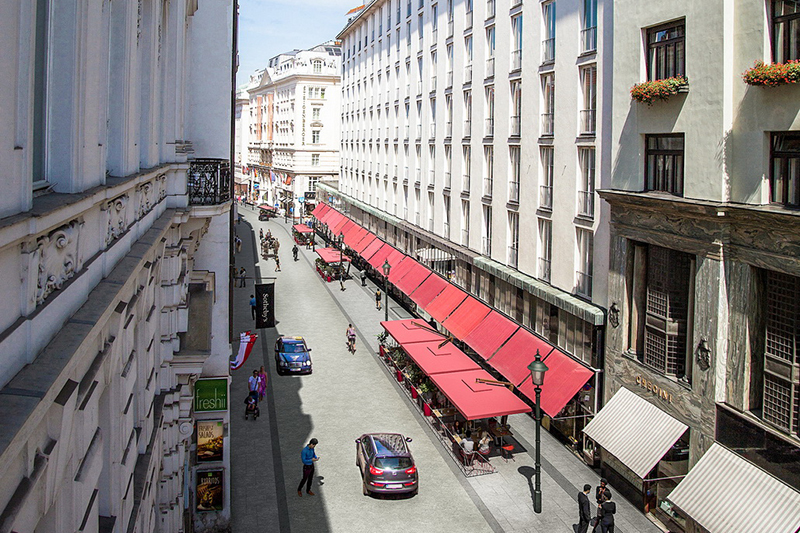 The privately financed road project represents an important axis between Freyung and Michaelerplatz. In this section several palaces, hotels, ministries, Vienna’s first high-rise building and the Loos house are located. Apart from Herrengasse, Fahnengasse and parts of Wallnerstrasse are reconstructed as well. With the implementation of the project this area receives an adequate surface for underlining historically important buildings. 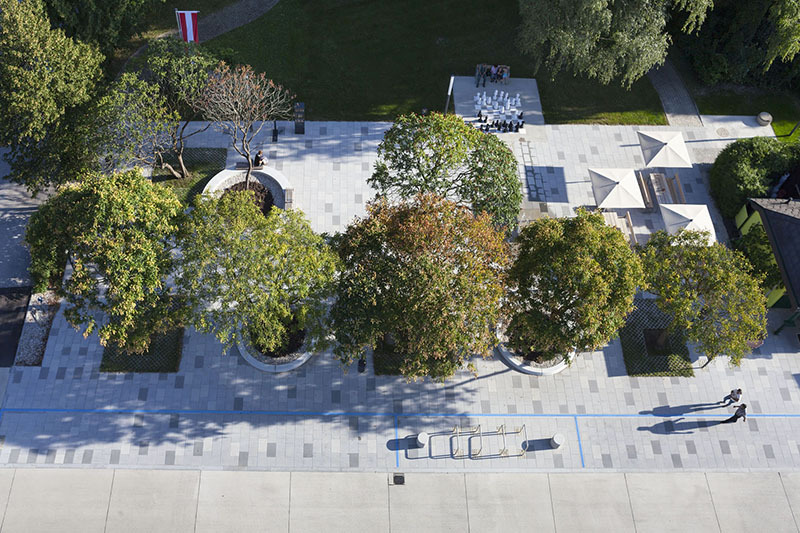 Apart from the new high-quality pavement (Austrian granite), lighting is also brought to the state of the art. The existing traffic organization is modified to a shared zone, which creates more areas for pedestrians and pavement cafés. The preliminary works – installation of fixtures – will start at the beginning of April 2016, the actual surface works will start at the end of May 2016. The conclusion of the works is expected by mid-November 2016. In the scope of Phase 1 of the Doha Metro project four underground railway lines shall be constructed on a total length of 172 km. The track system is designed as ballastless track with Porr slab track system and some sections as mass-spring systems. The design comprises tunnel sections, at grade sections, tracks on viaducts as well as turnout areas and the associated transition areas. As basis of the layout of the ballastless track the available alignment is revised and adjusted by VCE. VCE carries out analyses on the requirement of emission reduction measures (e.g. mass-spring systems) for providing the protection targets regarding vibrations, ground-borne noise and airborne noise. Extensive measurements were performed on site as a basis for these calculations. 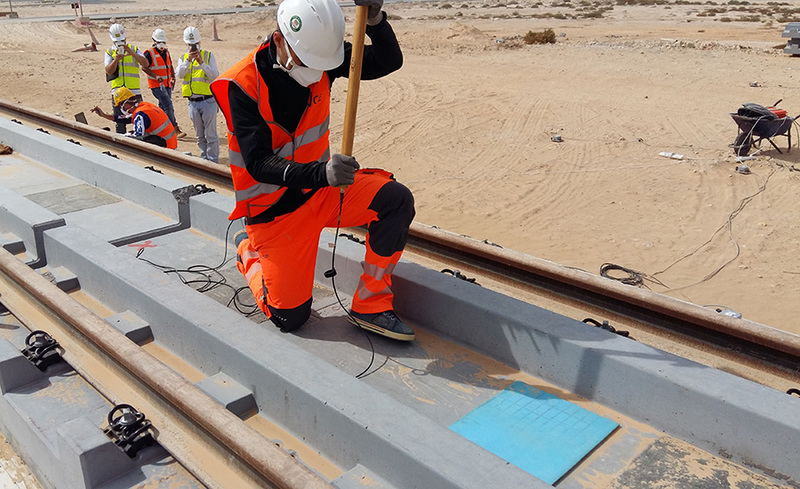 The production of the track supporting layers manufactured as prefabricated parts on site has already started, whereas the installation of the tracks is expected to begin in autumn 2016. The route of Phase 1 shall be put into operation in 2019, in due time for the start of the Football World Cup in 2022. Services of VCE: Project development and system configuration, concept and detailed design total track system, alignment, noise and vibration protection design, measurements on site. Obstetrics and oncology have already been among the focuses of the St. Josef Hospital for some time. This specialization shall be even intensified in future. Core piece is an annex which shall be opened in 2018. The extension shall result in an increase of capacities from 2000 to 3000 births as well as in the realization of the development to a specialized clinic for oncology. Up to 2020 the existing building shall be also comprehensively rehabilitated. The reconstruction is carried out without any interruption of hospital operation. 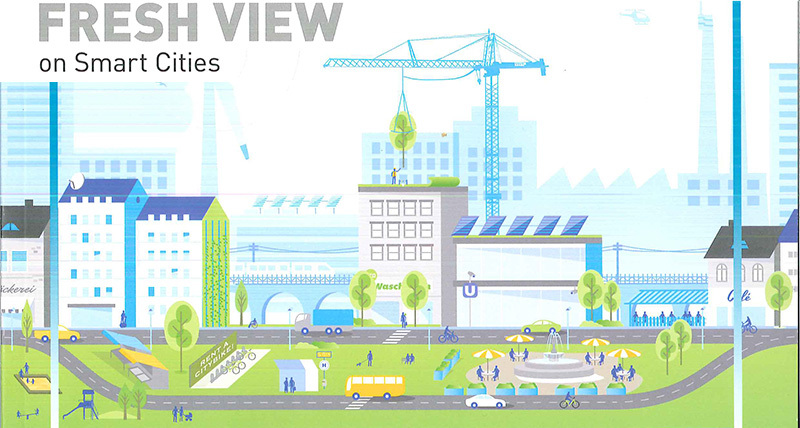 VCE will be presented on a full page in the issue of FRESH VIEW on Smart Cities. The magazine in German and English will be distributed to more than 110 branches of the Austrian Federal Economic Chamber world-wide. 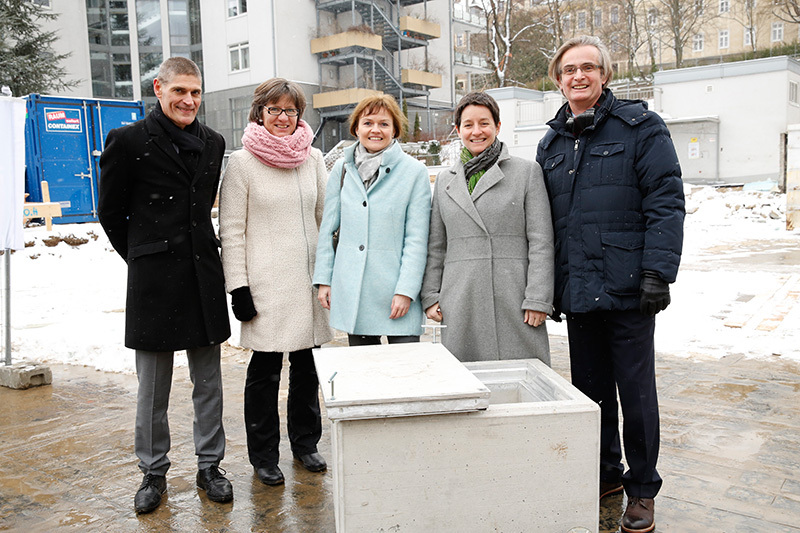 The topping-out ceremony of the new ÖAMTC headquarters took place on 14 December 2015. After an intensive planning period and a record-breaking construction time the shell construction was completed shortly before the ceremony. Ernst Klobucnik (ÖAMTC - Austrian Automobile, Motorcycle and Touring Club), Franz Lederhas (Granit) and Architect Christoph Pichler (see photo) thank all the persons involved in the project for the excellent and close cooperation. In less than 8 months approx. 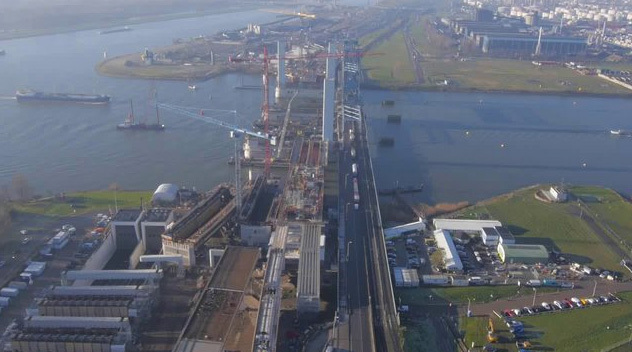 20,000 m³ and almost 4,000 t of reinforcement were used in the highly complex structure. 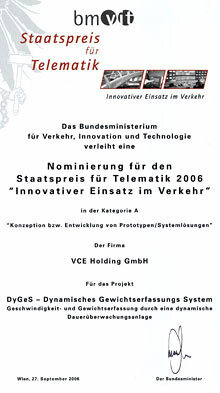 On 20 November 2015 the Ministry of Economics granted the Austrian Award for International Consulting andthereby recognized outstanding engineering consulting services. 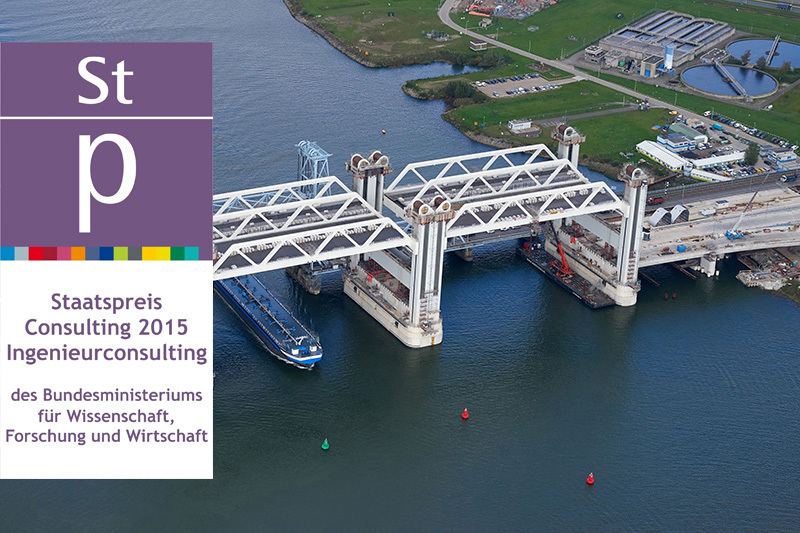 The prize winner is VCE Vienna Consulting Engineers ZT GmbH as design manager with the project "Botlekbrücke - die größte Hubbrücke der Welt" (Botlek Bridge – World’s Largest Lifting Bridge). The jury justified its decision with the unique realization of the project by skilful combination of geotechnical, hydraulic, construction as well as traffic and transport engineering, which shortened the lifting time of the bridge to only 110 seconds. "The realization of such a big and fast lifting bridge represents a major innovation on the highest international level. Furthermore the project excels due to a considerable increase in capacity of the traffic carriers and a high service life of 100 years even from an economic point of view”, commented the jury. The new Botlekbrug over the Oude Maas is now officially opened for the traffic. 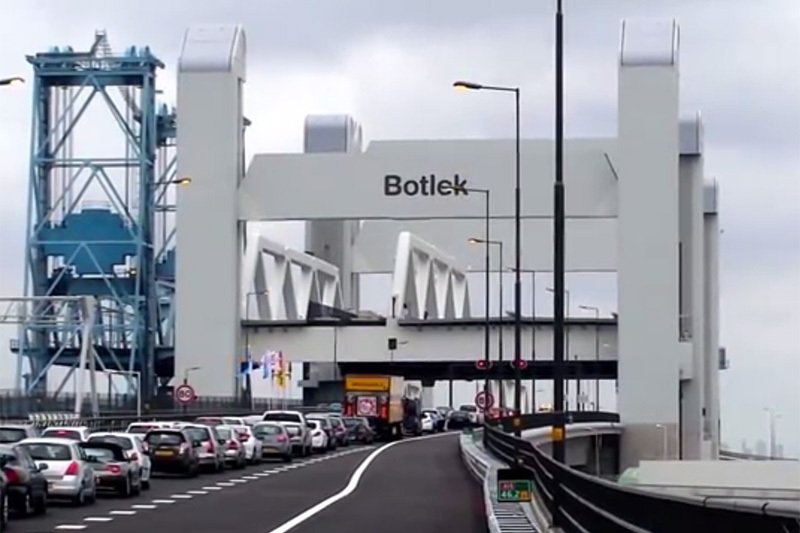 On Sunday, July 12, 2015, the first cars crossed the bridge in the direction Rotterdam at 10 clock. 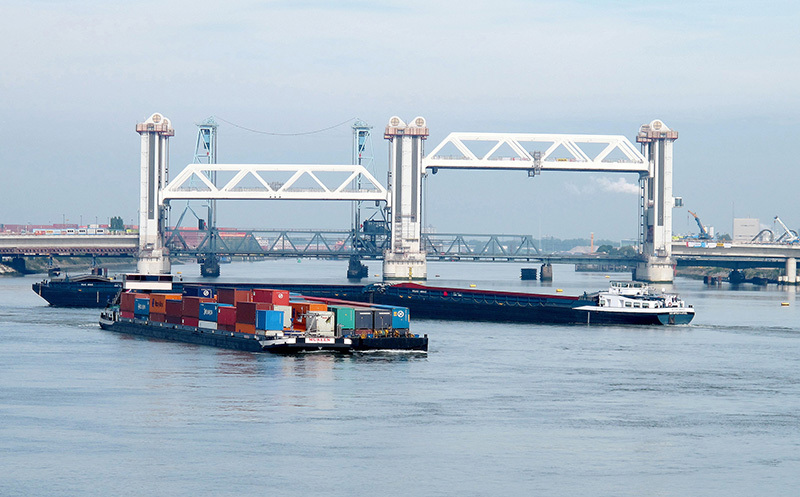 The Botlekbrug is the largest lifting bridge of the world and should solve the traffic problems between Rotterdam and the port area Maasvlakte 2. 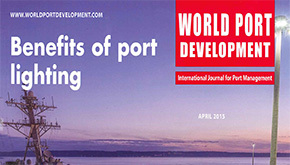 Article of Peter Furtner (VCE) and Nigel Nixon (NNP Inc) in the journal "World Port Development", issue April 2015, about dynamic structural monitoring and Life-Cycle Management of port facility structures. 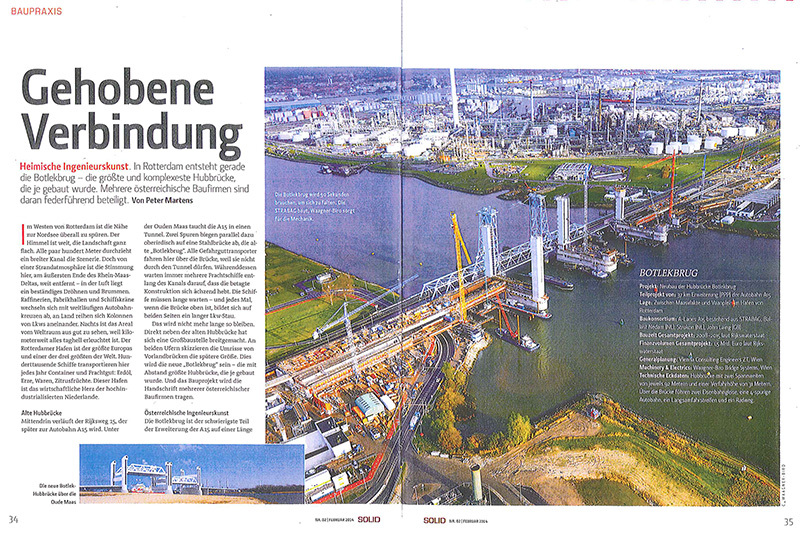 Contribution on the Botlek Bridge in Rotterdam by VCE in the bridge construction journal "Brückenbau", issue 6 - 2014 by the publishing group Wiederspahn. 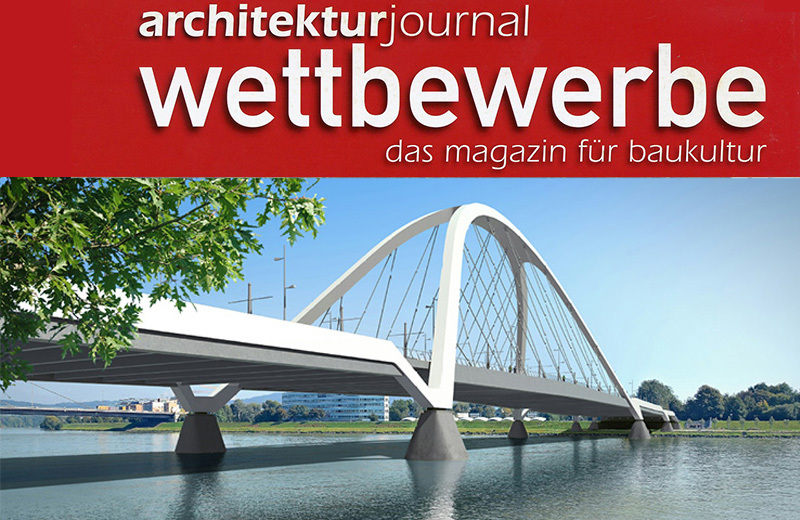 A report on the realization competition for the new Danube Bridge Linz was published in the December issue of the architectural journal “Wettbewerbe”. VCE in consortium with FCP Fritsch, Chiari & Partner ZT GmbH and Quist Wintermans Architekten reached the 3rd place in the Linz bridge competition. 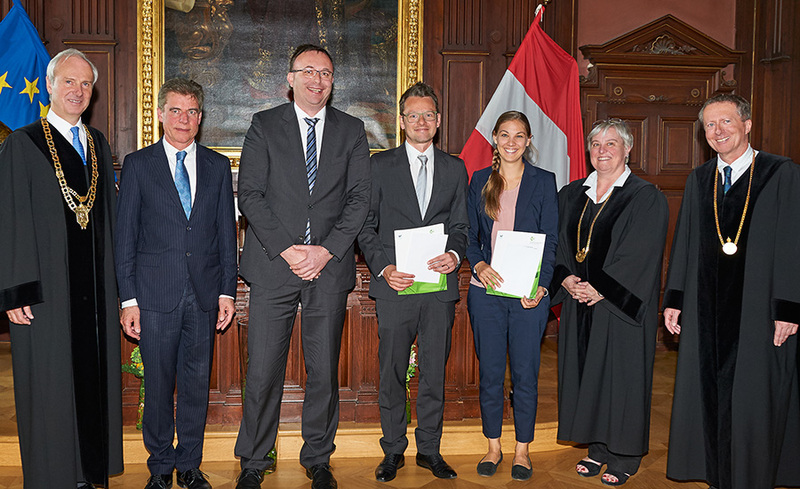 The Vienna Engineering Prize is awarded by the city of Vienna in collaboration with the Chamber of Architects and Engineering Consultants for Vienna, Lower Austria and Burgenland every two years. The Engineering Prize recognizes extraordinary engineering services and aims to contribute to a higher perception of the technical professions in the public. This year 31 applications were submitted. Five engineering teams were nominated for this year’s 4th Engineering Prize. 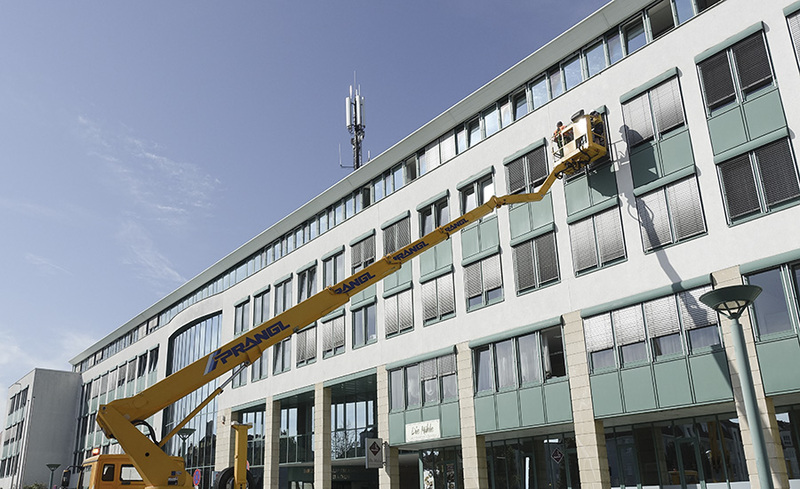 VCE was nominated for the planning and construction of the world’s biggest cable crane. 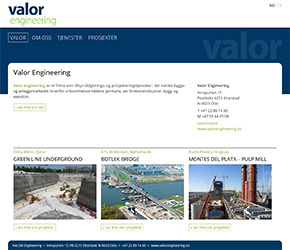 The new web page of Valor Engineering is online. Thus Valor can present itself even better on the Norwegian market. 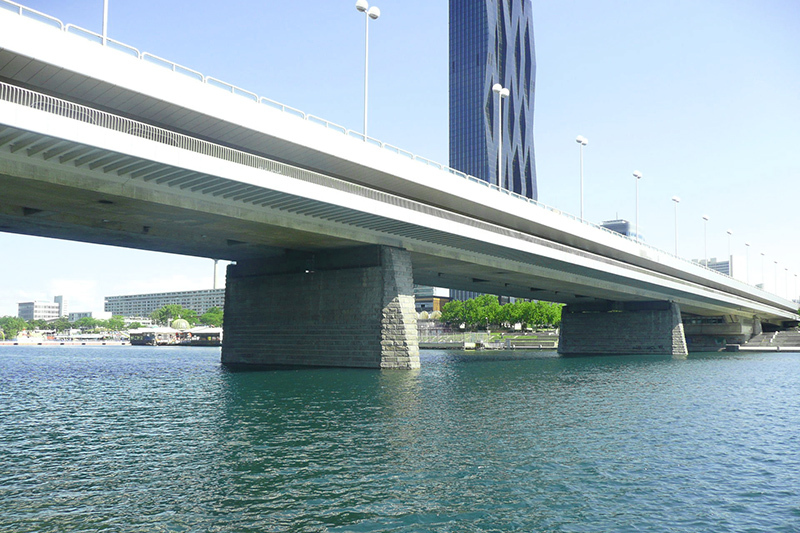 Recently Valor succeeded in concluding a framework contract for infrastructure projects with Statens Vegvesen. On 13 September the first superstructure of the new Botlek Bridge was successfully assembled and deposited on the temporary bearings. 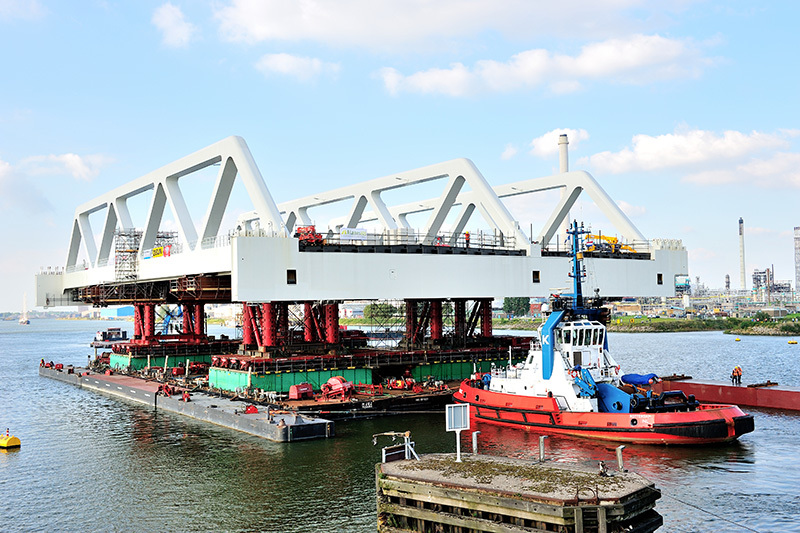 On Friday, 12 September transport on the pontoon started from the pre-assembly site at the Mammoet-Harbour in direction of the building site. At approx. 5:00 p.m. the bridge passed the old Botlekbrug observed by many onlookers and was positioned in front of span 40-50. On Saturday, 13 September at .5:00 a.m. lateral adjustment was started. At 6:45 p.m. the final position was reached and lowering was begun by means of the low tide. At approx. 10:30 p.m. the first contact with the bearings took place and at approx. 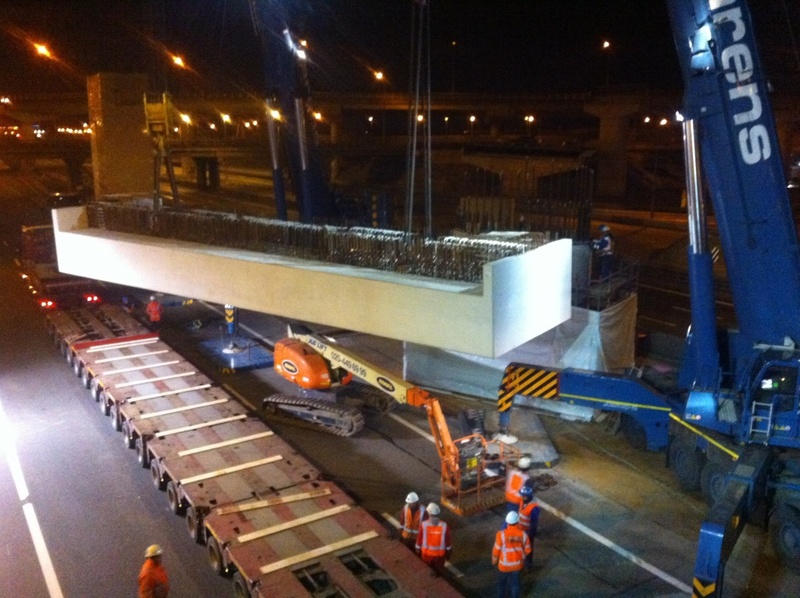 11:30 p.m. the bridge was removed from the pontoon and successfully put down. The results of the individual work packages of the research project NERA were summarized in a brochure designed by VCE. 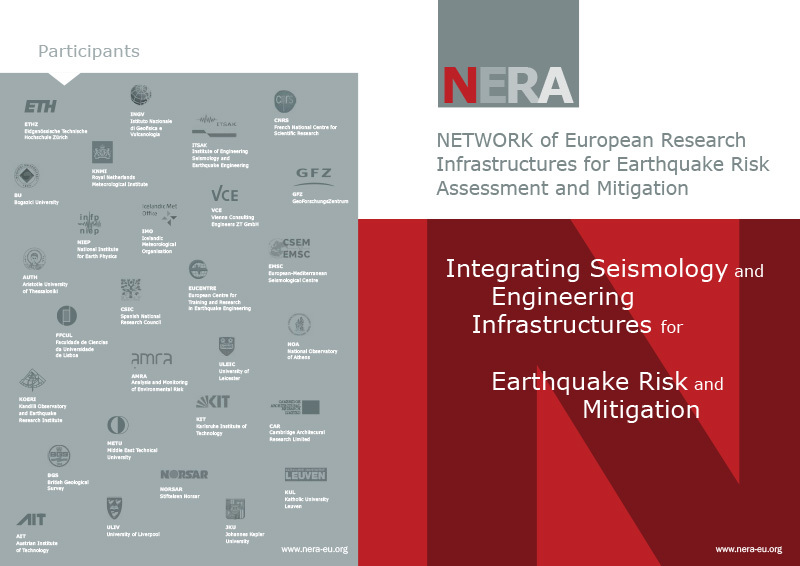 NERA (2010-2014) is an EC infrastructure project that integrates key research infrastructures in Europe for monitoring earthquakes and assessing their hazard and risk. SYNER-G is a research project with a focus on systemic seismic hazards and risk analyses of buildings, lifelines and infrastructures. 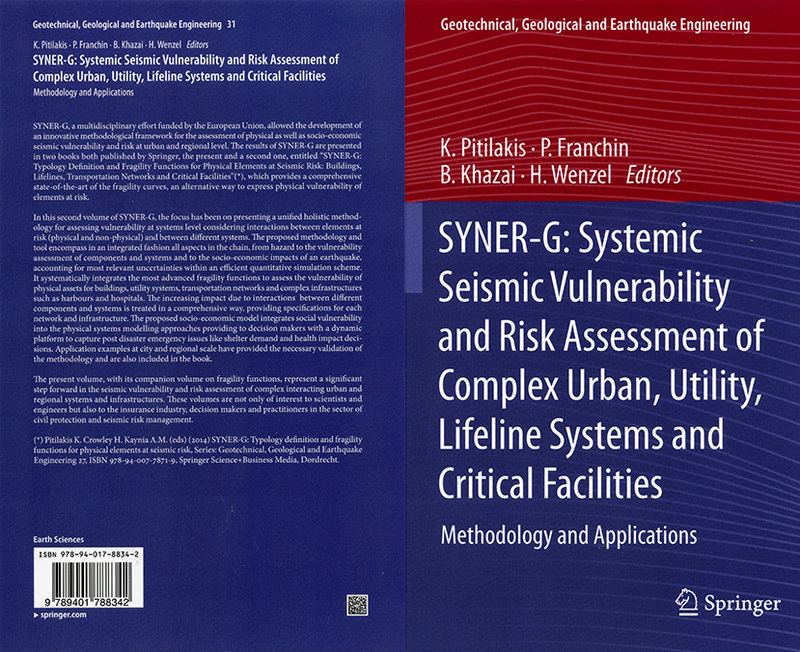 A book on the results of the SYNER-G research project was published in 2014 and represents a significant step forward in the seismic vulnerability and risk assessment of complex interacting urban and regional systems and infrastructures. 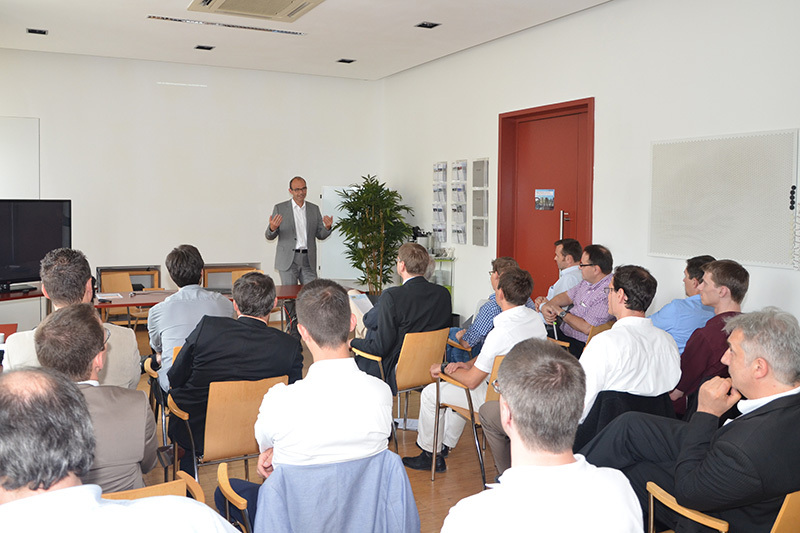 The BIM event on 24 June 2014 organized by VCE under the motto "BIM in Theory and Practice" met with great interest also this year. The advantages and various applications of BIM were demonstrated to the participants during the symposium lasting for three hours. The programme was presented by Robert Schedler. Presentations were given by Christian Artaker and Andreas Stocker / Artaker CAD-Systems, Alexander Barnaš / Maba, Gernot Wagner / Porr, Konstantinos Kessoudis / Strabag, Christoph Degendorfer/ PXT as well as DieterDenk / FCP. Since last summer, the cooperate management of the AF Group worked to create an independent company that will engage in engineering and project management. 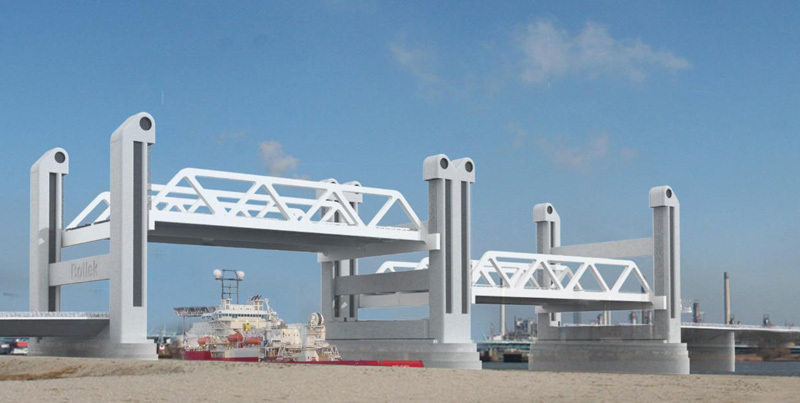 The Botlekbrug – the biggest and most complex lifting bridge ever built – is currently being constructed in Rotterdam. ... Vienna Consulting Engineers are responsible for the design management for all site progress related trades, detailed design, site supervision and project management. The specialists from VCE have successfully handled thousands of building projects world-wide but this project is even unique for them. 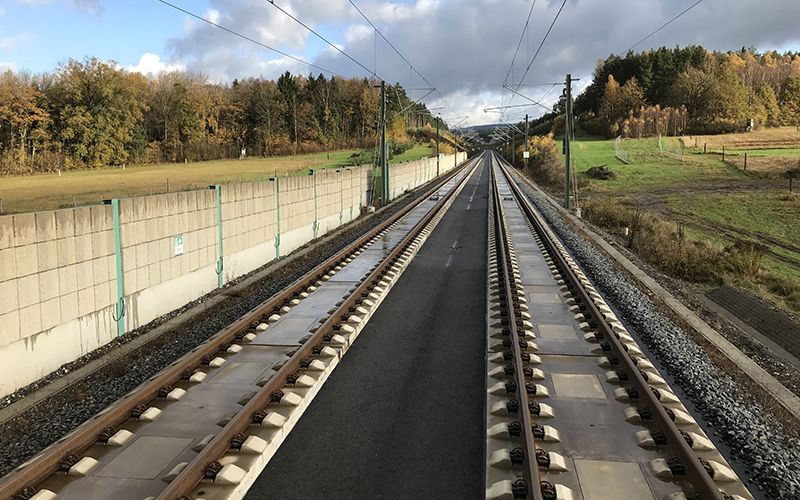 The tracks for the most modern rail track in Central Germany have been completed. 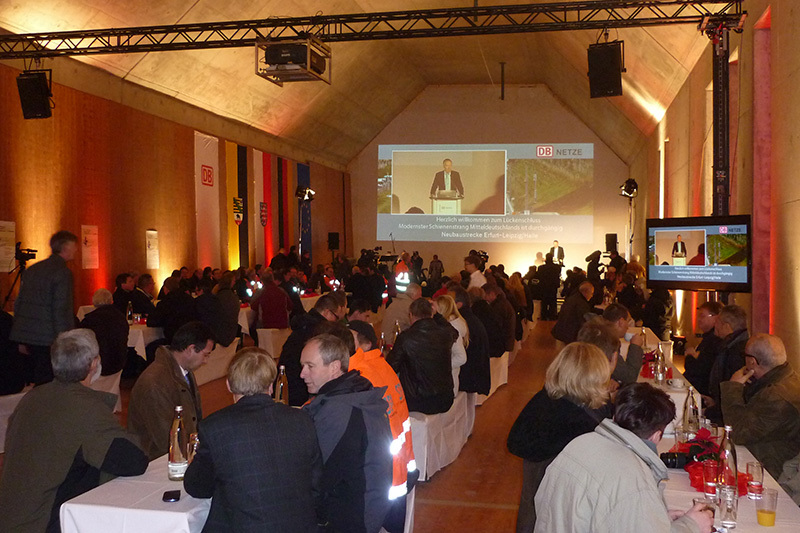 On 25 November 2013 Ms. Christine Lieberknecht, prime minister of the Free State of Thuringia, and Dr. Reiner Haseloff, prime minister of the German state of Saxony-Anhalt, passed the first continuous and cross-national ride with a test train of the German Railways. All structures and tracks have been completed to a large extent. Now the newly built route will be equipped with further technical components until 2015. 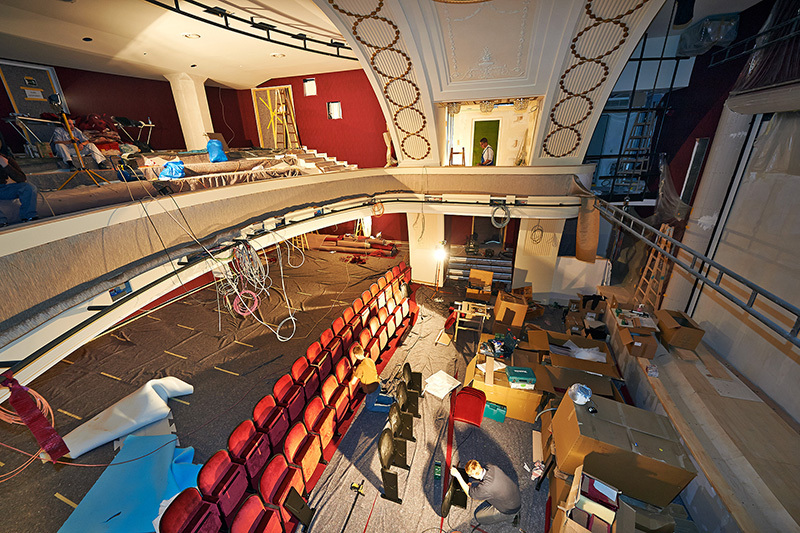 In only five and a half months the 100-year-old theatre was completely refurbished. In this extremely short construction period the core of the existing structure was fully removed, the stage portal and the balcony were newly covered with concrete, the stage machinery and the technical building equipment were modernized and the total extension was completed. At the opening of the refurbished Kammerspiele theatre on 23 October the Broadway musical hit “Catch Me If You Can” was performed as European premiere. 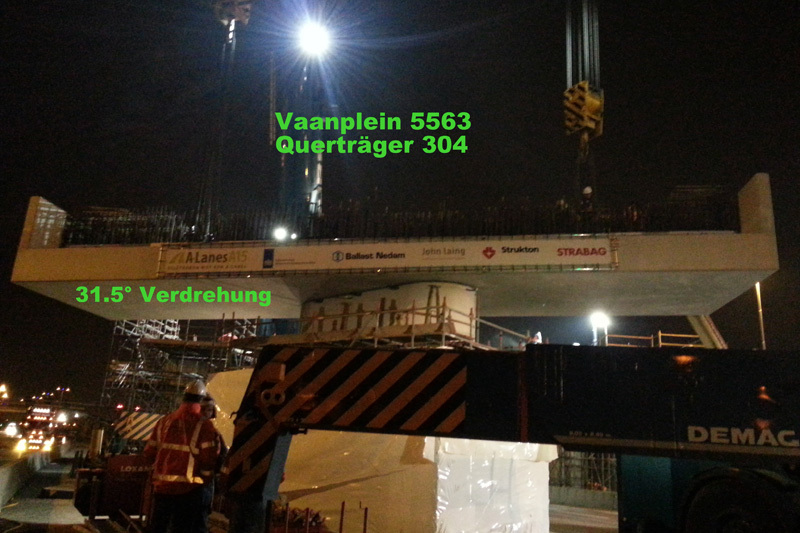 On Friday, 5 April 2013, the transversal girder 304 was successfully installed. This was the heaviest concrete element of the whole project with a length of 16.80 m, a width of 4.40 m and a height of 2.61 m as well as a total weight of 224 tons. 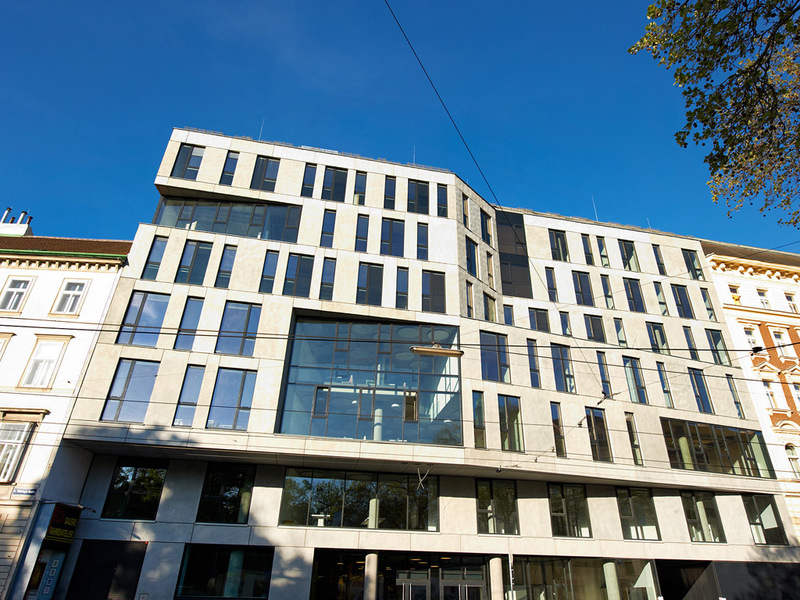 The eMagazine "austria-architects" nominates the new institute building of the University of Vienna in Währinger Strasse in Vienna's 9th district building of the month. 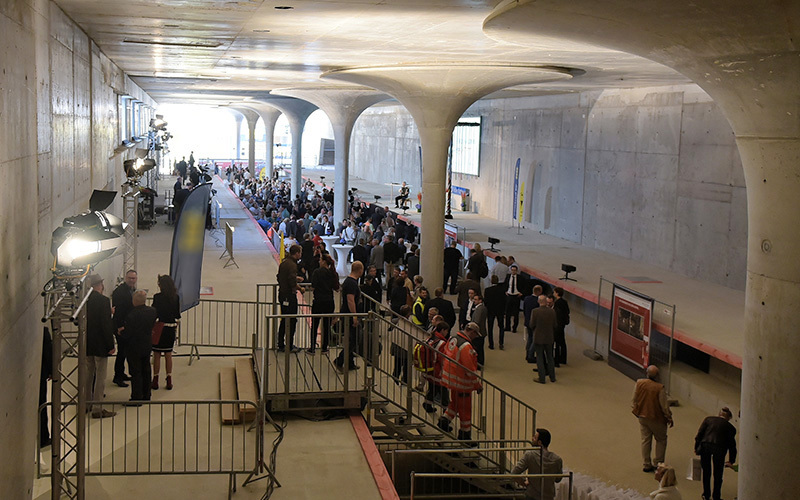 On Tuesday, 6 November, the pre-opening of the complex, which is a superstructure over the railway station Wien-Mitte, took place in the presence of the Austrian President Heinz Fischer and Vienna’s Mayor Michael Häupl (SPÖ). The building will be open to the public from 8 November. Then part of the 30,000 m² shopping centre “The Mall” will also be put into operation. In a first step the local supply for the core area around the railway station shall be restored. Only in April 2013 shall “The Mall” be fully launched with approx. 50 shops. 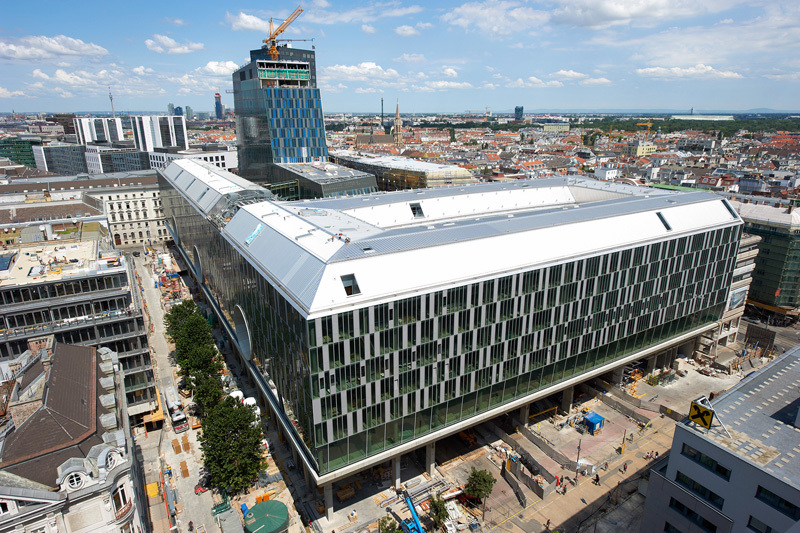 By 2015 the most modern hospital in Austria with 785 beds is to be completed. A special feature of the new hospital is the complex design of the exterior area with a park landscape (healing gardens) and therapeutic function. On 19 June 2012 the new info-box of the German Railways (DB) for the project VDE 8.2 was inaugurated at the Osterberg Tunnel. Many VIPs were present, including the district administrator of Sachsen-Anhalt, Minister Webel, the coordinator of the overall project VDE 8, Mr. Drescher, the project manager of the section VDE 8.2 new line, Dr.-Ing. 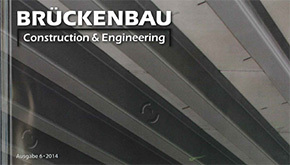 Schenkel, as well as Mr. Hagen as person responsible for our trade ballast-less track. 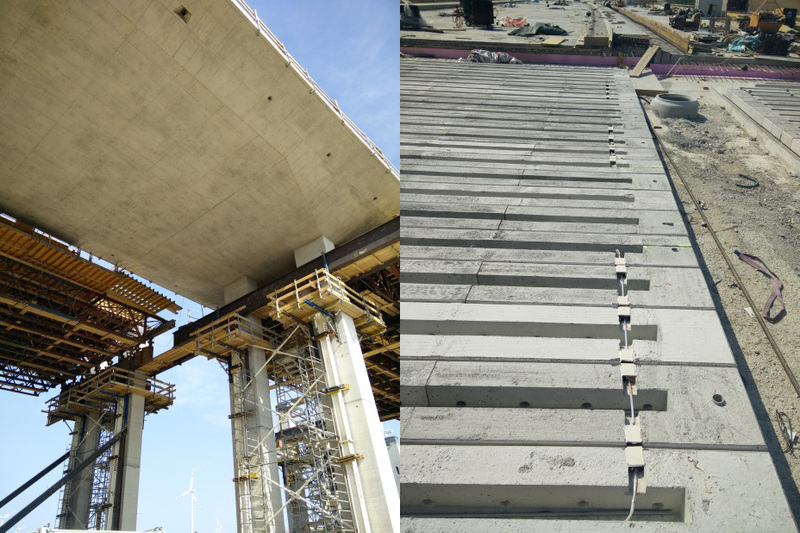 The works on the building site of the A15 Maasvlakte – Vaanplein are running at full speed! Apart from the setting up of the pile foundations on site, there is assiduous work at the prefabricated parts of the individual sections. 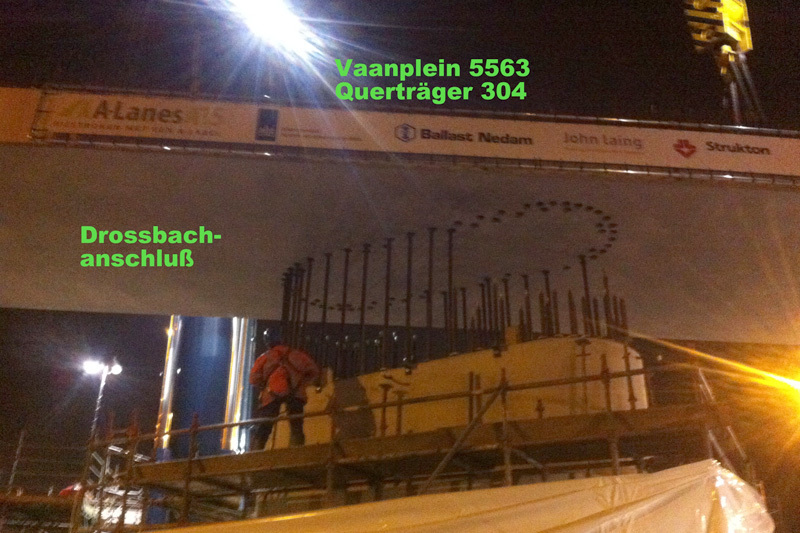 In the video the manufacturing of the prefabricated parts for the foundation of the object 5563 in the Vaanplein junction is visible. 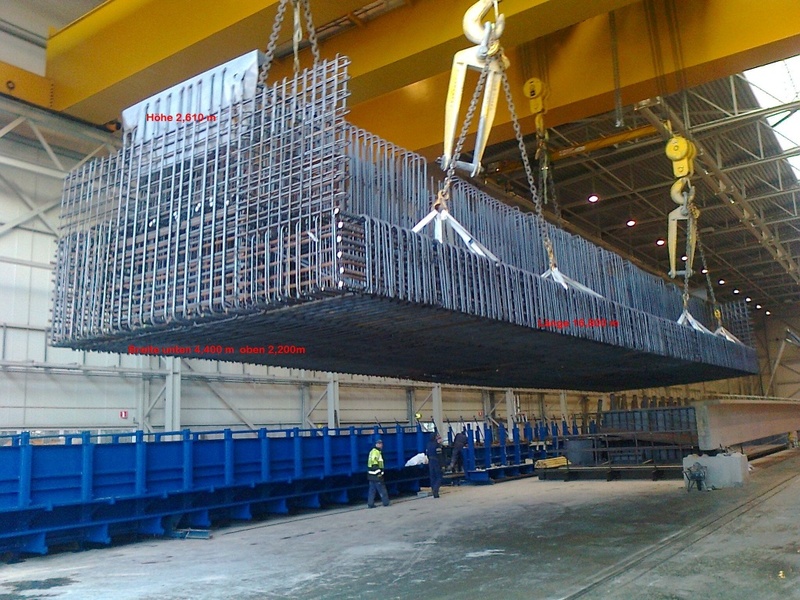 The weight of the prefabricated component shown amounts to approx. 160 tons. 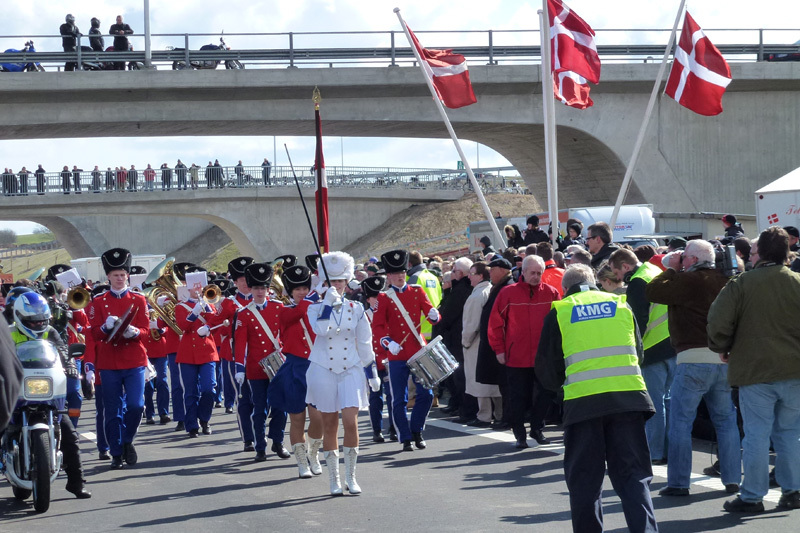 After two years of construction the Kiplev-Sonderborg Motorway in South Denmark was solemnly inaugurated by the Danish Minister for Traffic and Infrastructure on 31 March 2012. The project was carried out in the scope of a PPP model by the Strabag consortium "KMG" (Kliplev Motorway Group) within the contractually agreed deadline. The total construction costs amounted to approx. 130 million Euro. VCE in joint venture with Drees & Sommer Infra Consult fulfilled the tasks of LTA (Lenders' Technical Adviser) for the financing banks and was responsible for schedule review and quality inspection as well as check of the construction progress and the approval of invoices compliant with the services. Due to delays in construction additional services for project control and mediation were taken over on the consortium's request. 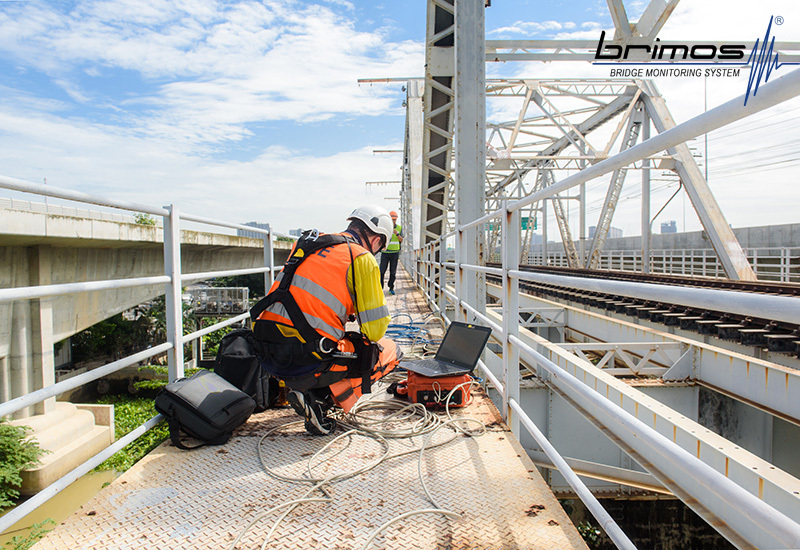 The objective of the research activity is the registration of vehicle speed and weight in real time by means of the measurement of the dynamic characteristic of bridges. 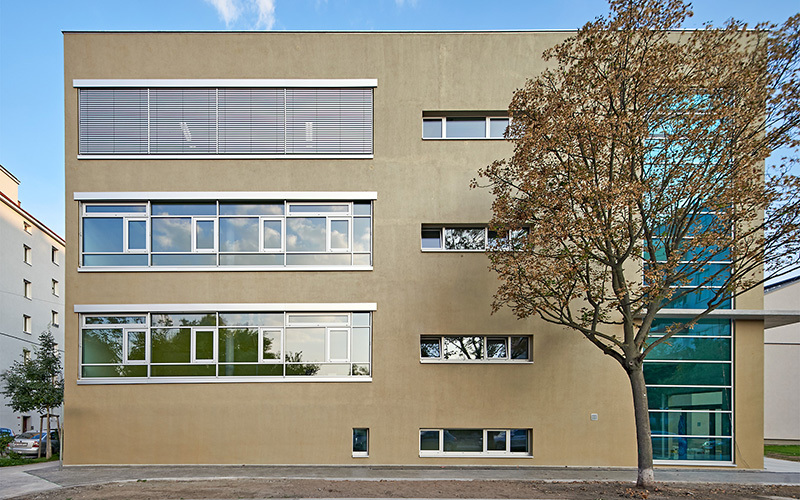 The new building is the new academic home of six college courses, which were housed in up to ten different buildings in Wels until June 2005. 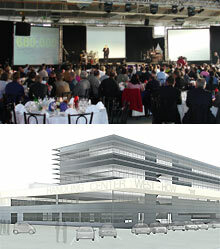 On the 6th of July 2005 the Handling Center West was inaugurated. The newly constructed Handling Center West is adjacent to the Air Cargo Center.